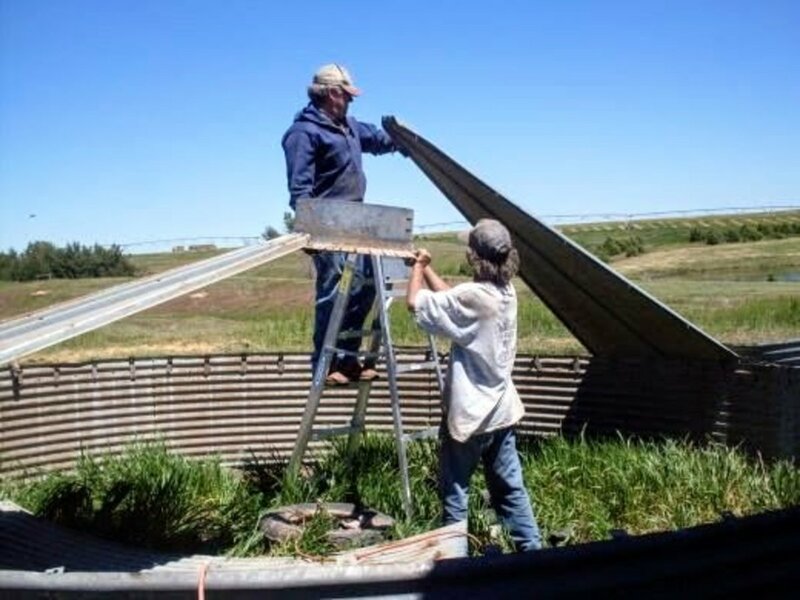 Joy worked in sheet metal construction for 7 years, alongside her husband - primarily working on pole barns, grain bins, and barn repairs. The bin in this article is a 5-ring, 6,000 bushel Butler brand from the 1950s. 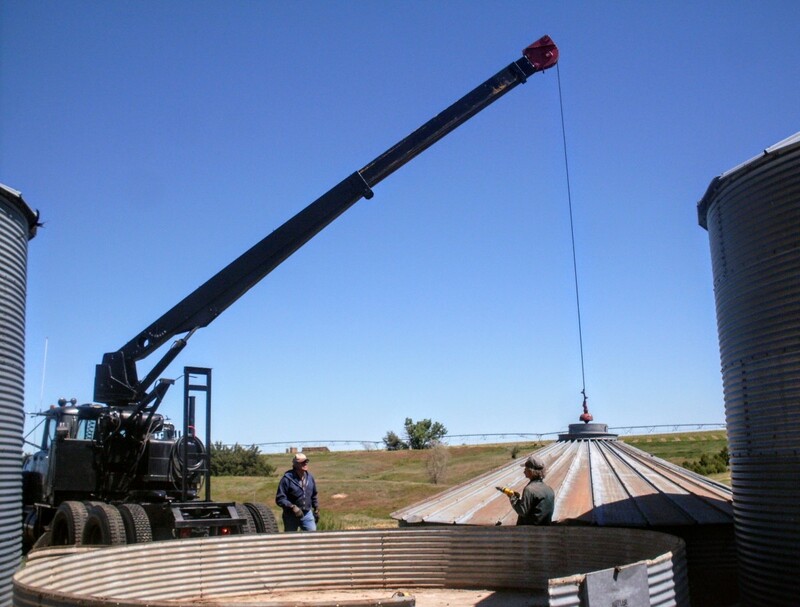 I have had many e-mail requests from people all over the U.S. on how to dismantle a used grain bin in order to move it to a new site. Here is the step-by-step tutorial I've promised you all. I do not consider this article done; it needs some tweaking. But I've done my best to make it clear and intelligable enough to work from, and if you have further questions or remarks, the Comments section is open at the bottom. By the way, my husband and live in Colorado, and usually do not work out of area. So we are generally unavailable to help you move your own grain bins. I do not know other contractors out of our area who do this kind of work. Sorry. 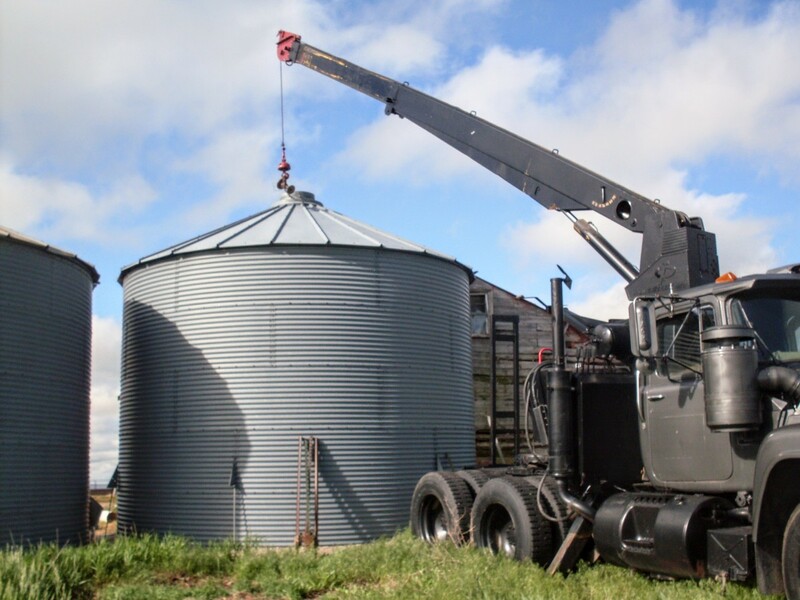 Weather can easily make or break your grain-bin moving day. The slightest breeze can turn a bin hung from a crane into a wrecking ball...or a mashed up piece of trash. 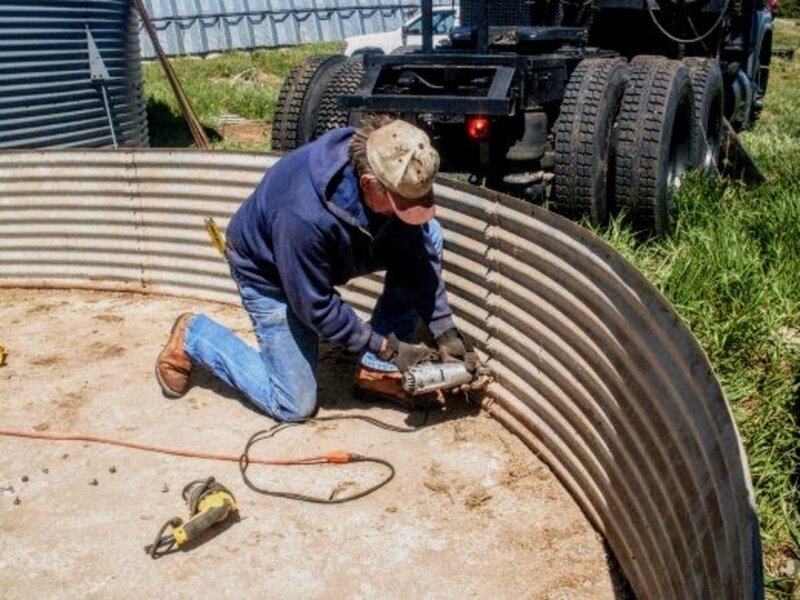 A slight shift in a bin, hung six inches from the ground, can cut off a foot or crush steel-toed boots right into your toes. Therefore, we recommend that you use extreme caution when deciding whether this is the day to get your bin moved. 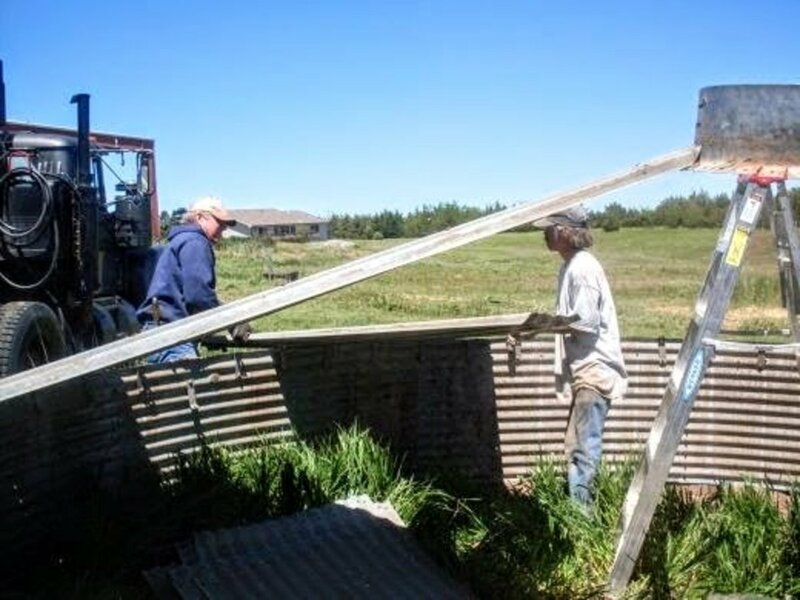 If you should start disassembly, and the breeze comes up, the safest thing to do is to set the bin firmly on the ground, put the crane or boom truck arm on top of it, and drive 4' metal fence posts into the ground at intervals close around it. How many you'll need and how deep to drive them depends on the size of the bin, and on how soft your ground is (or isn't). This will hopefully keep your bin from blowing away (and maybe taking your boom truck with it), until you can return when the weather is nicer. Besides all this, you should consider humidity. 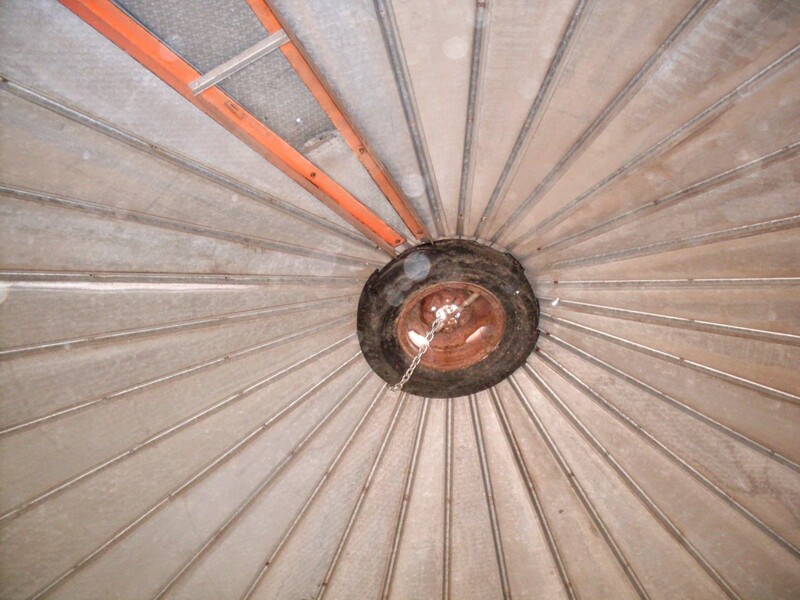 A grain bin is shaped much like a water bottle, and acts much like one, with condensation forming easily, and water vapor finding it hard to exit. Even fairly dry weather outside can mean a sweltering atmosphere inside a bin. If you are doing your bin-moving project in the summer, we recommend trying to work in the early morning(s) as much as you can, before the sun hits the bin full-force. There is such a thing as a "professional" lifting ring. 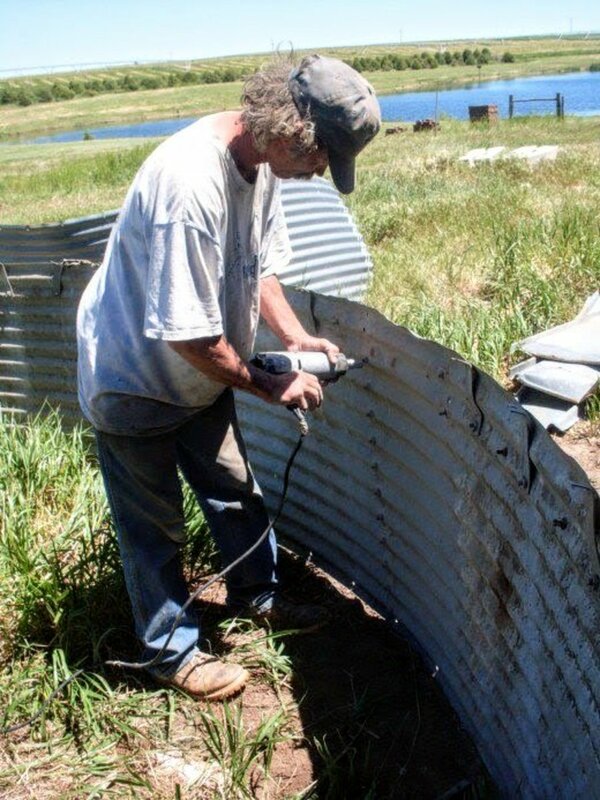 But they seem to be scarce, so unless you care to weld your own, you're probably out of luck. Most often we use an old semi-tractor wheel with the tire still attached. On the semi wheel, we used a round plate that is placed under the wheel and is of a size that it cannot fit through the center hole of the wheel. On that, we have welded a large-diameter rod in a semi-cirle, to which we attach the boomtruck hook. 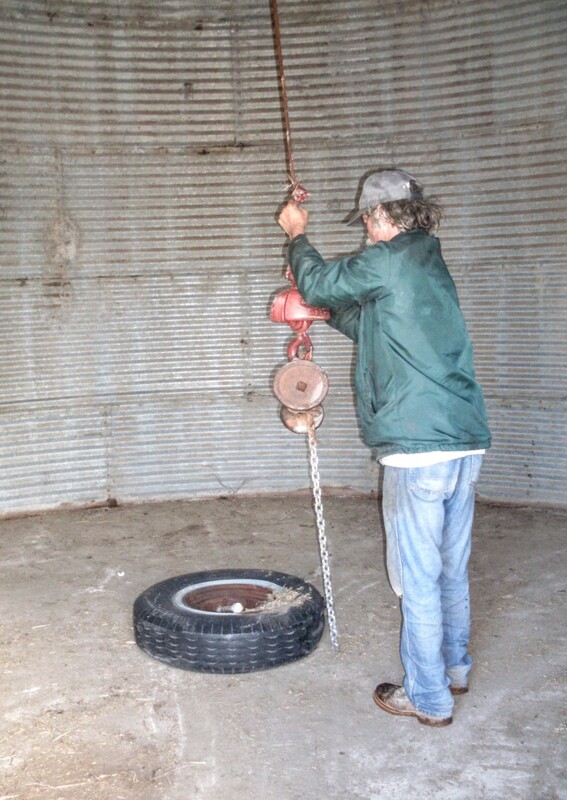 You can also make a lifting ring out of a large-diameter spoked iron wheel. Just wrap a length of log chain around it where it will stay level on its own, and be easy to hook up. This one appears to be loose, but isn't on the inside. We will therefore finish dealing with it last. 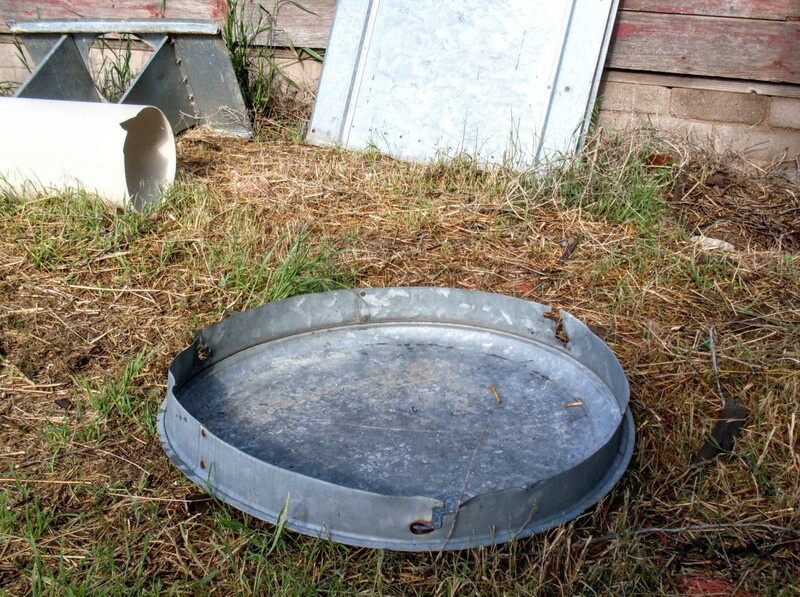 If you could easily get the bin loose, you would start the dismantling process with this bottom ring. Since we couldn't, we climbed to the roof and removed the lid. (Not the collar!) There are a variety of attachment methods for lids. Toss the lid to the ground. You won't want to try to climb down with it. 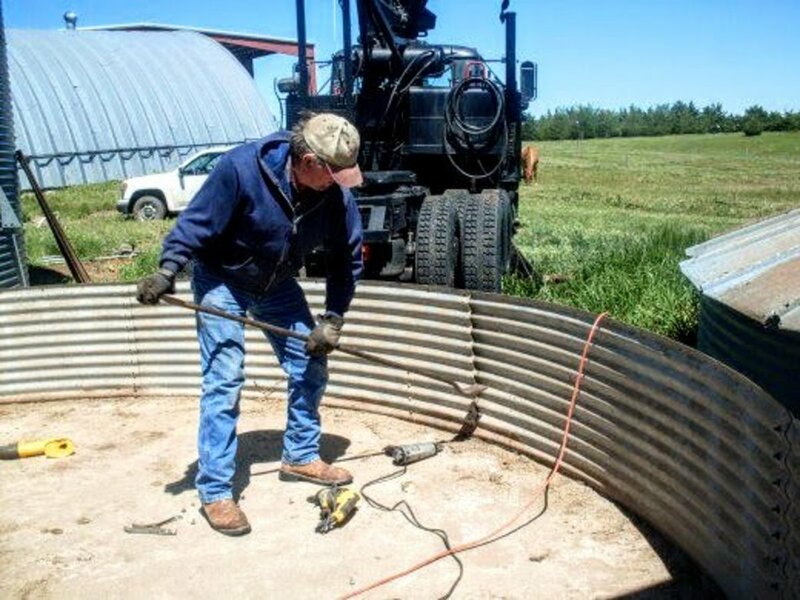 If the bottom ring is heavily cemented or is rusted severely, cut it off with a torch, grinder, or plasma cutter in an appropriate place to bolt on a new base angle. Next, start on the door and doorframe. Expect the bolts to fit tightly. On many older bins, there are a variety of fasteners. Sometimes, they are rusted past loosening. You may need a torch for situations like this. Sometimes, vice grips placed snugly on the inside of the bolts will hold them enough to allow the impact wrench to loosen them. 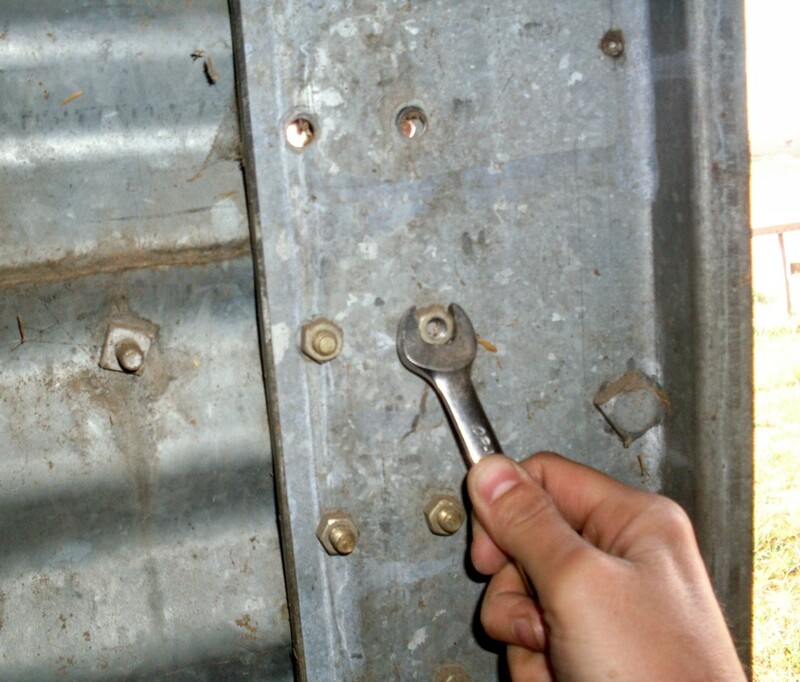 Using a box-end wrench outside and vice grips or another wrench inside is another possibility. If you have someone on the inside, attempting to hold the vice grips, be careful! Hand and wrist injuries are very probable, should the vice grips slip, or get twisted out of the user's hands. For not-so-tight bolts, a regular wrench will do. 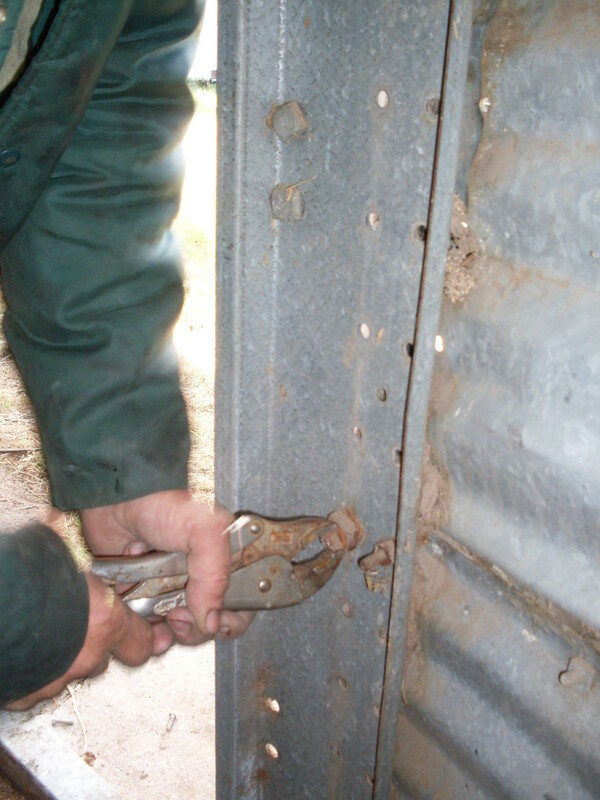 Leave one bolt at the top until last, so you can control until the last second how stable the doorframe is. ...or it may need help coming out. Lay it out of the way, outside. 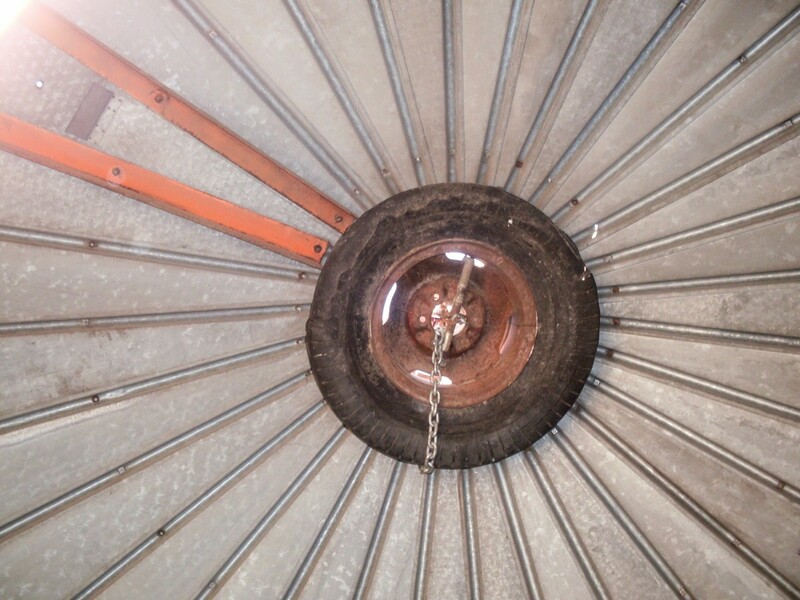 Position lifting hook in exact center of bin roof opening. Lower hook nearly to floor of bin. Attach lifting ring. There is such a thing as a specially-made lifting ring, but the one we commonly use is a large truck tire with a securely fastened log chain around it. 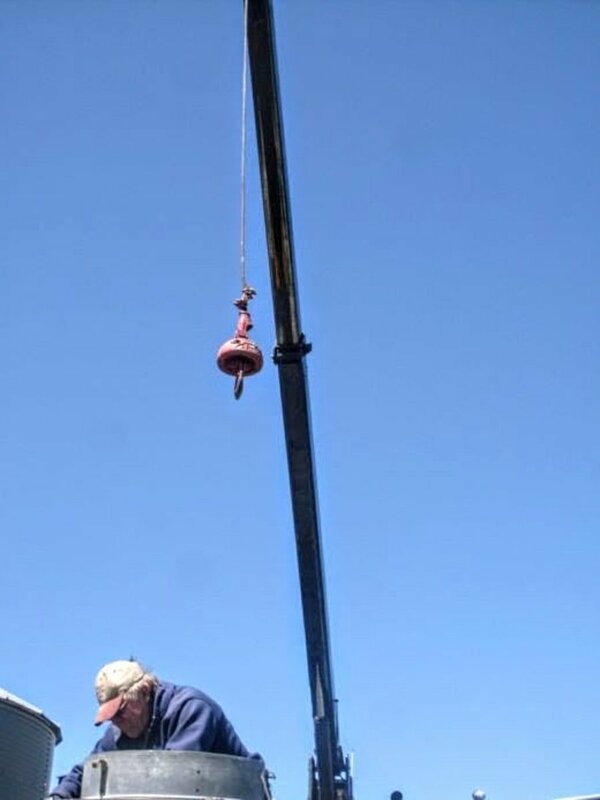 Attach the chain or lifting apparatus to the crane hook, and lift toward roof. Since we cannot easily loosen the bottom ring from the foundation, we start with Ring 2. Unbolt the first two sheets to the right of the door (reference point inside the bin). Finish unbolting Ring 2 all the way around. You will need one person inside with an impact wrench, and other person outside with a box end wrench (or two, depending on how fast you move). Next, spray paint a #2 on all the sheets on this ring (sweep dust off, as necessary). This will become important during re-assembly. 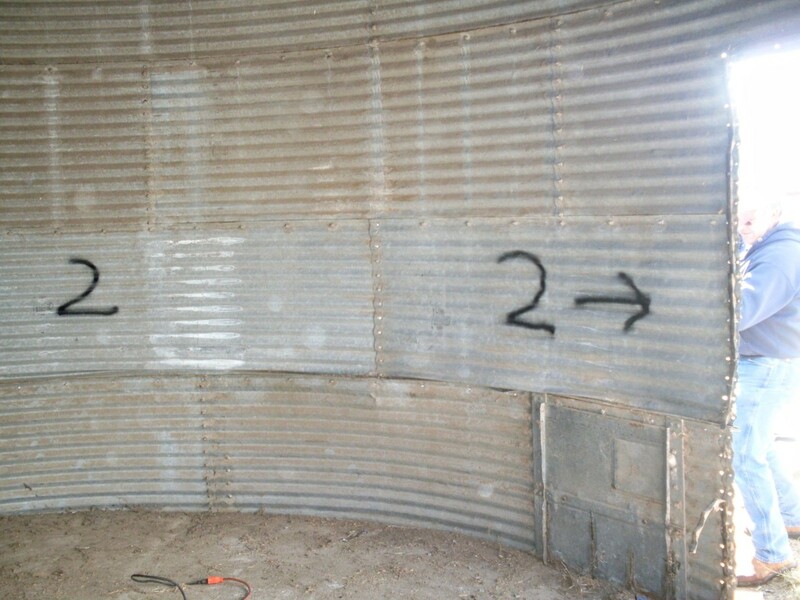 If you screw up and put a sheet that goes on Ring 3 on the bottom ring, your bin will most likely collapse. Break the rings away from each other, so the bin moves freely and doesn't bind on the bottom ring. The tool shown is available at many hardware stores, but a large crow bar will work as well. 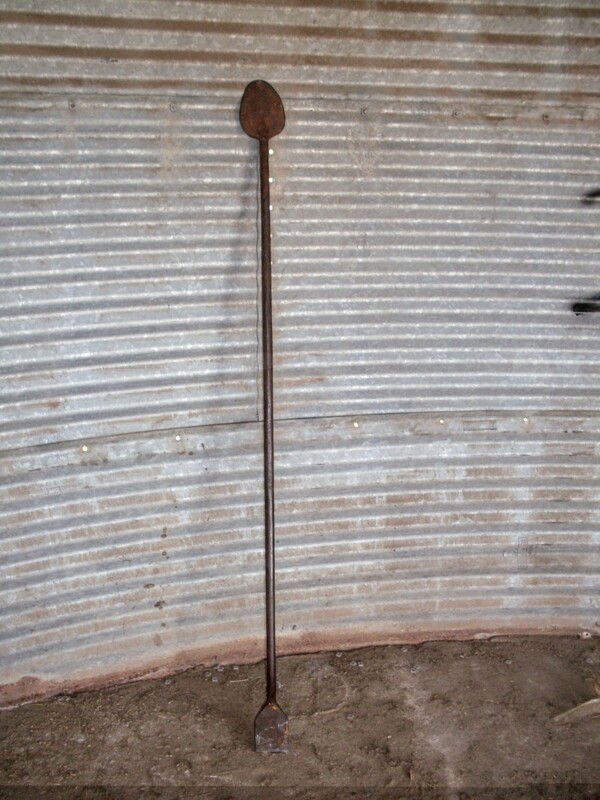 The tool is about five feet long, and is made of steel. The ends are shaped for prying and wedging. Stack all the sheets from Ring 2, either out of the way or in your trailer. You may wish to adjust the height of the bin before proceeding, depending on whether it is swinging too freely in the breeze. 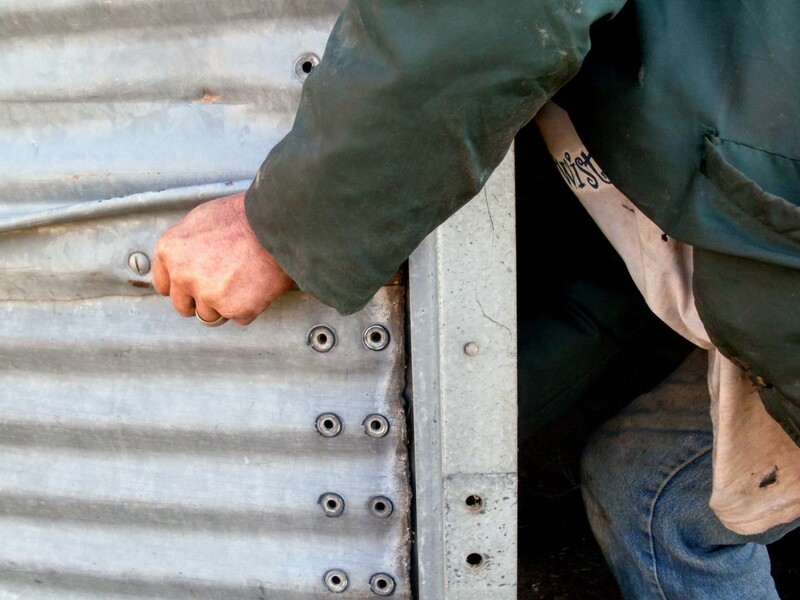 Take off brackets and stubborn bolts any way you can (don't destroy brackets, though). Try the simplest, less destructive way first (unscrew them). grinders, or torches are all good options. Proceed removing sheets according to how they are lapped, prying or kicking them loose once unbolted, and stack. For Ring 4 (2nd to last ring), start on sheet above door: (inside vantage point) do left seam, then right, then top. Proceed counter clockwise (from inside)...then next sheet clockwise...then next two counter clockwise (according to seam laps). 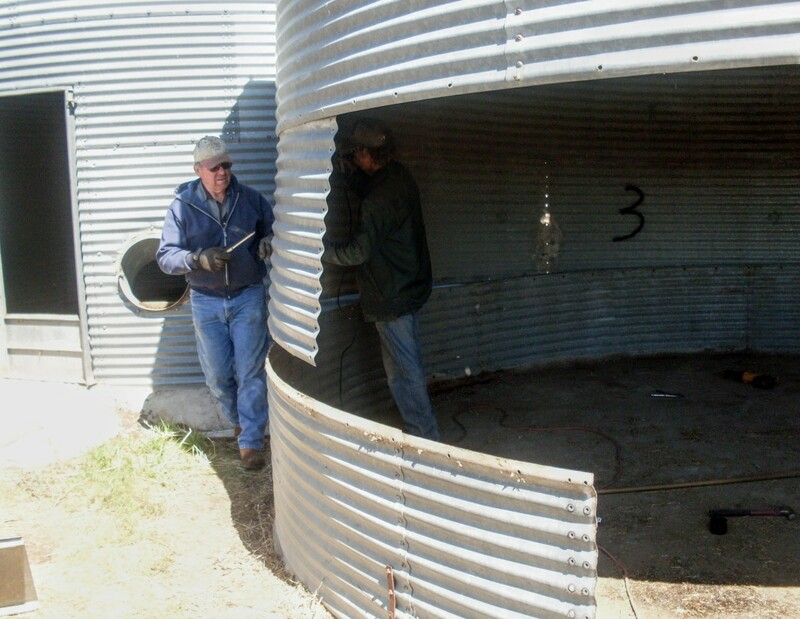 It takes two experienced people only about 20 minutes to dissassemble a ring on an 18' diameter grain bin. 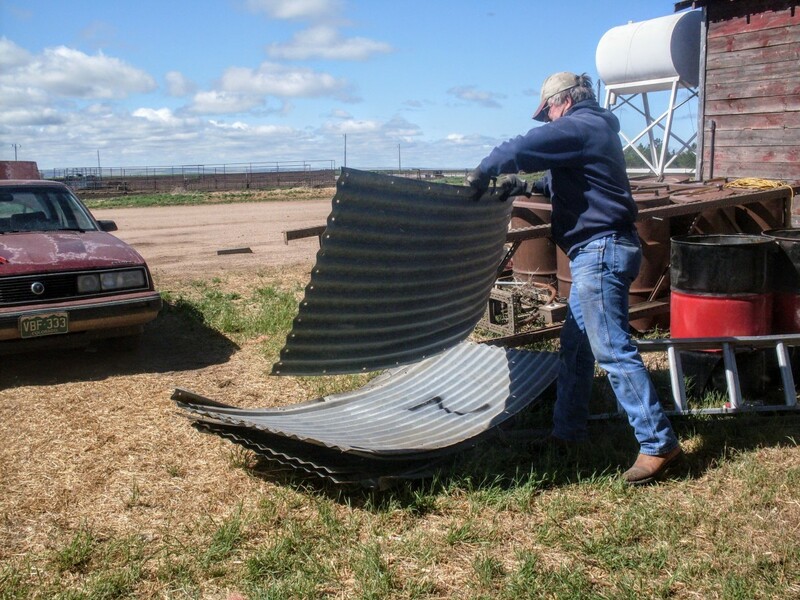 If you use your head about stacking sheets, you can use a tractor or forklift to load them onto a trailer, in the order needed to re-assemble. About hardware: Do not try to re-use the hardware! The water-resistant washers on the bolts may not be good anymore. Bolts and nuts are cheap compaired to a bin full of wheat or other grain - or a leaky cottage, if you plan to use the bin for a residence. Trash the used nuts too, as they are frequently rusty and a bit rounded. Finish removing any sheets attached to the top ring. ...and set it down in an appropriate place for disassembly. Now you are ready to begin removing the roof sheets. 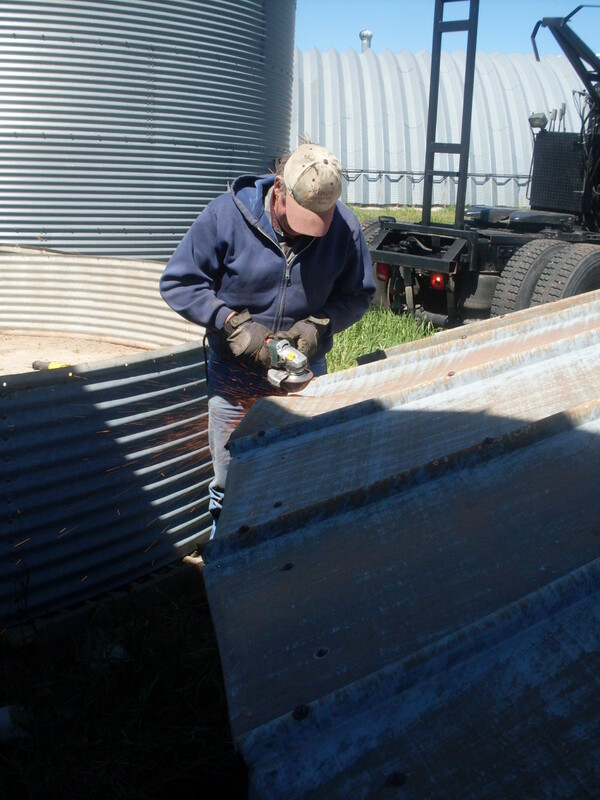 Disassembly of grain bin roofs can be tricky. Some common-sense precautions must be observed. Let's start with scaffolding. 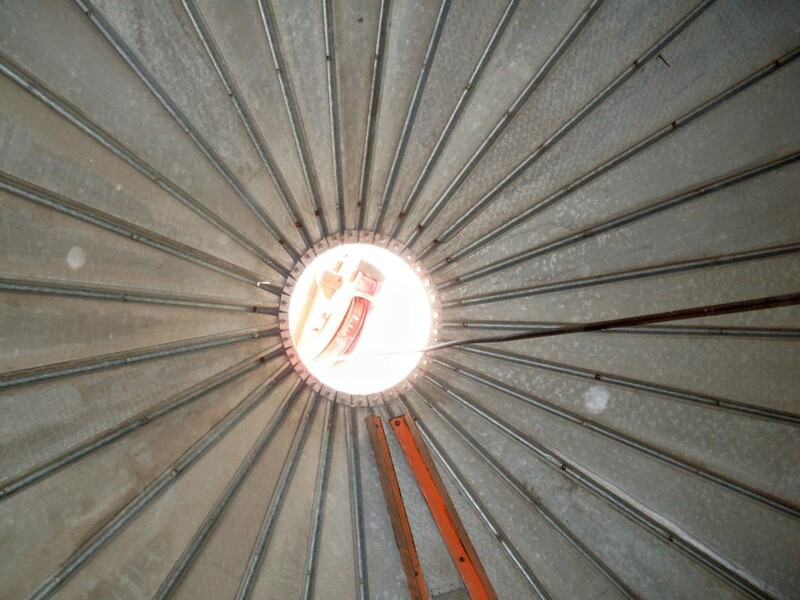 Scaffolding is recommended if the diameter of your bin is more than 18 feet (6 meters). You will want to figure out the height at which to set your scaffolding before you get it in place. 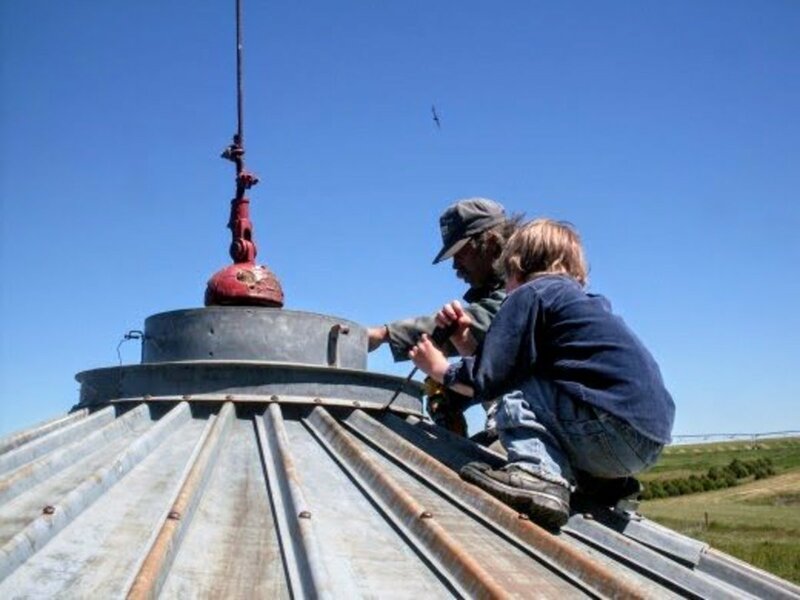 It is a good idea to put in the scaffolding as soon in the disassembly process as possible, as it will normally fit through the door of the bin, but not through the roof manhole. 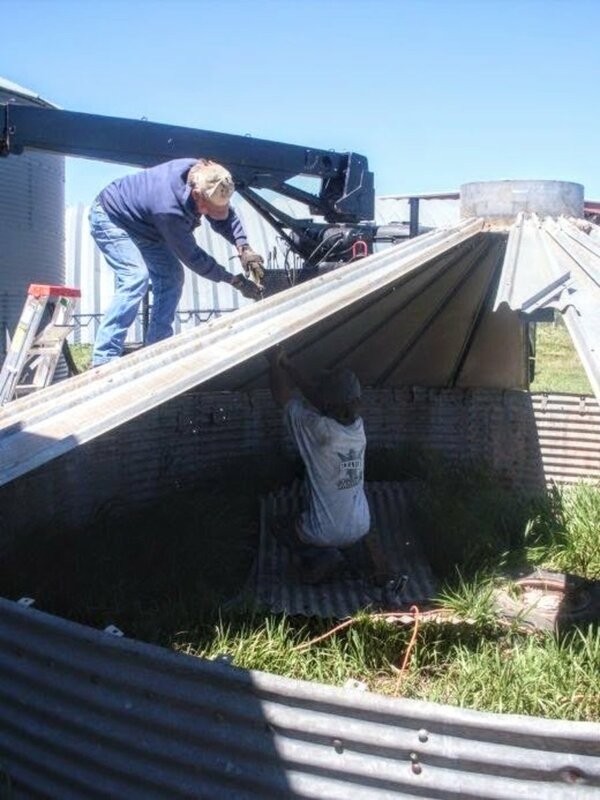 Lastly, once you start removing pieces of a grain bin roof, it becomes extremely unstable. The roof as a whole is relatively strong - but as soon as you take it to bits it's nothing but some pieces of easily crumpled, easily bent metal. 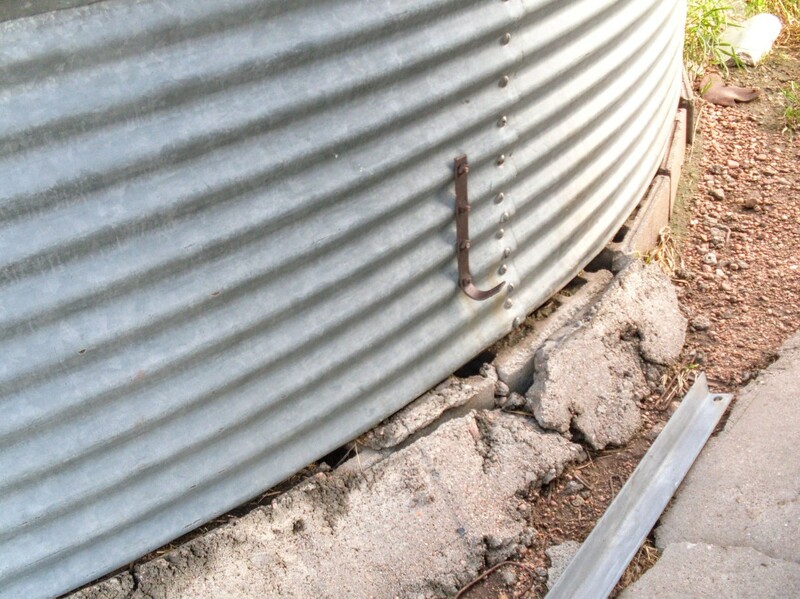 For this reason, it is important to work in a specific pattern while removing roof sheets. You will remove the sheets in opposite pairs, to maintain the integrity and balance of the roof as long as possible. 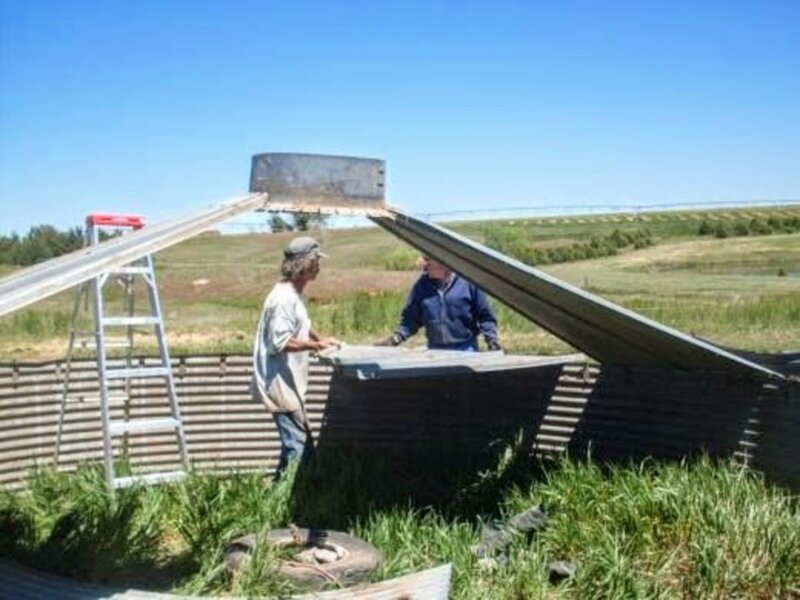 When you get down to just a few sheets, it is extremely helpful to have a third, strong person, even if you have managed the rest of the bin with just two workers. First, assess the hardware and accessories. 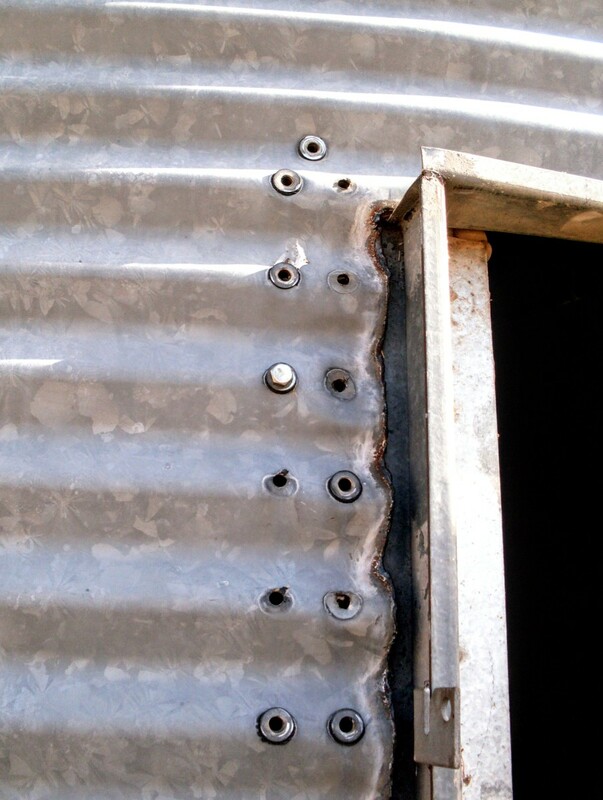 If there are support irons bolted and/or hanging from the bottom of the roof sheets - i.e. under the roof ladder - remove the hardware and support irons in a manner that won't give you injuries. 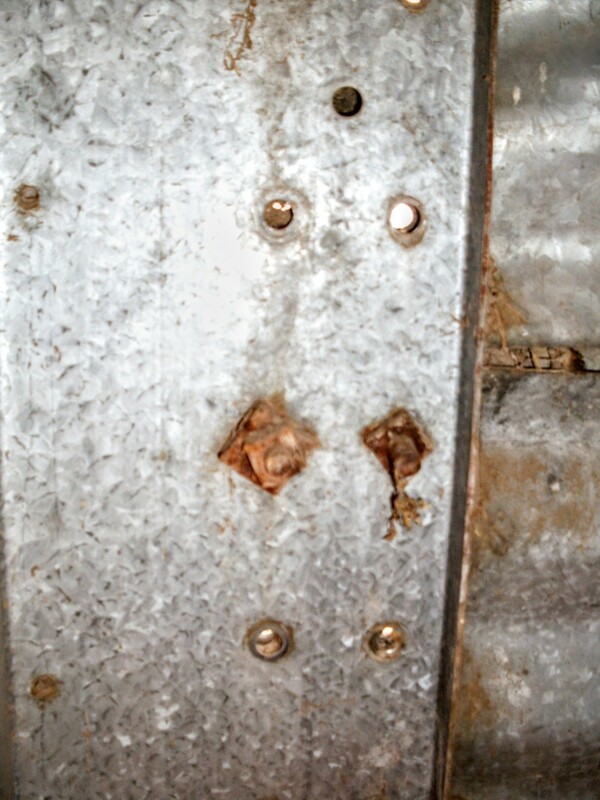 Next, leaving the top (collar) and bottom bolts intact, remove the rest of the bolts and nuts from the roof. 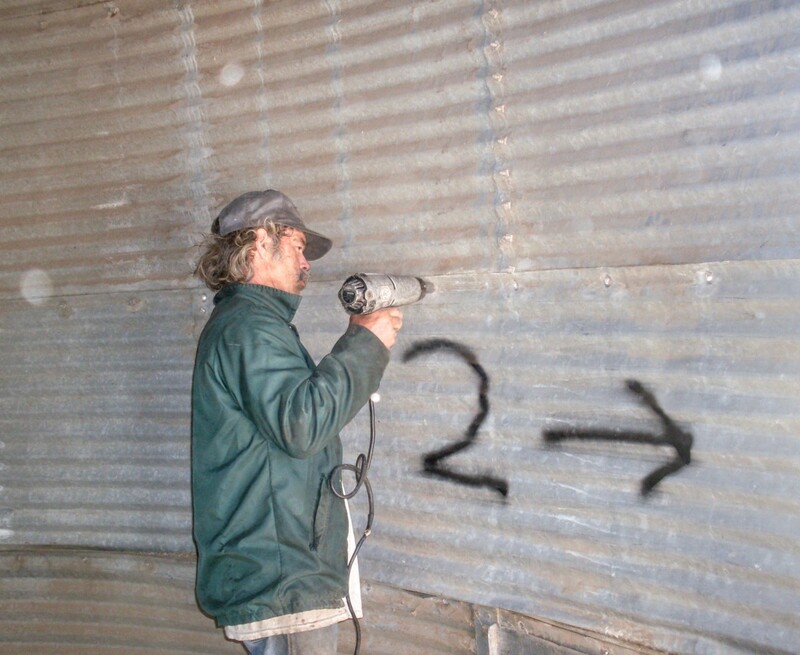 From the top side, using an electric impact wrench, you should be able to reach about three roof sheets at a time. After all bolts except for the top and bottom have been removed, the person on the ground removes the bottom bolts from a sheet (do ladder sheet first). 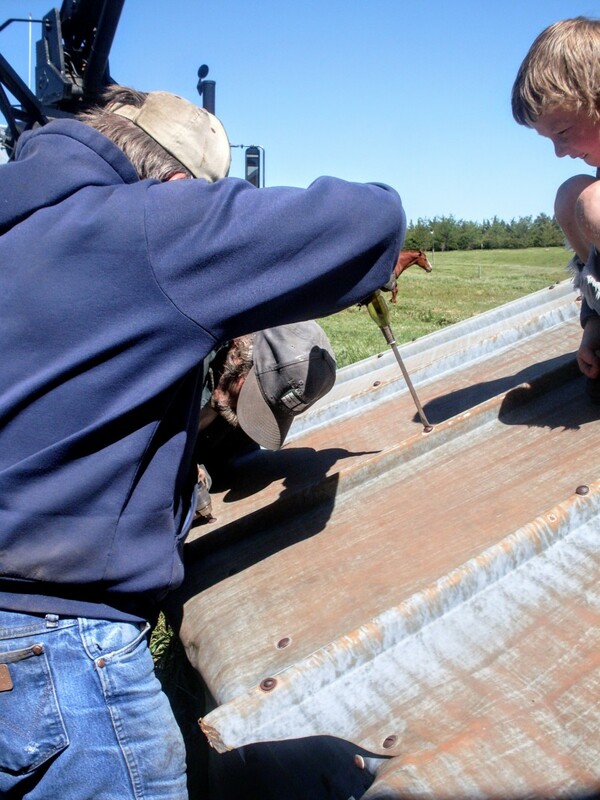 Then, the person on the ladder removes the top bolt and assists in sliding the roof sheet down. Do this in a pattern of 12:00, then 6:00, then 3:00, then 9:00, until there are only 4 or so sheets left. You must remove the sheets in opposites, so the roof doesn't collapse. Use extreme caution on the last four or five, using a stepladder or scaffolding as a platform. You will need a moderate amount of strength and leverage in order to safely handle these last sheets. 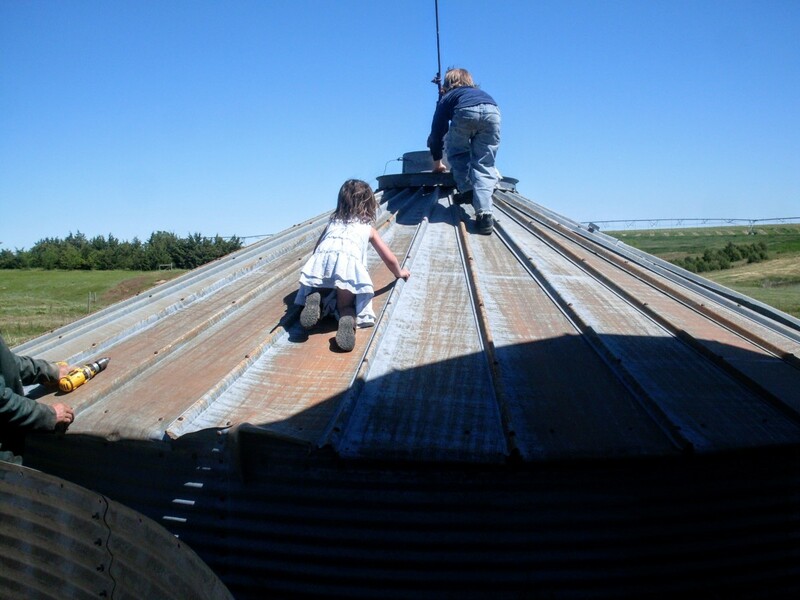 My kids, who have been on grain bin building sites nearly all their lives, can't resist a lowered roof. 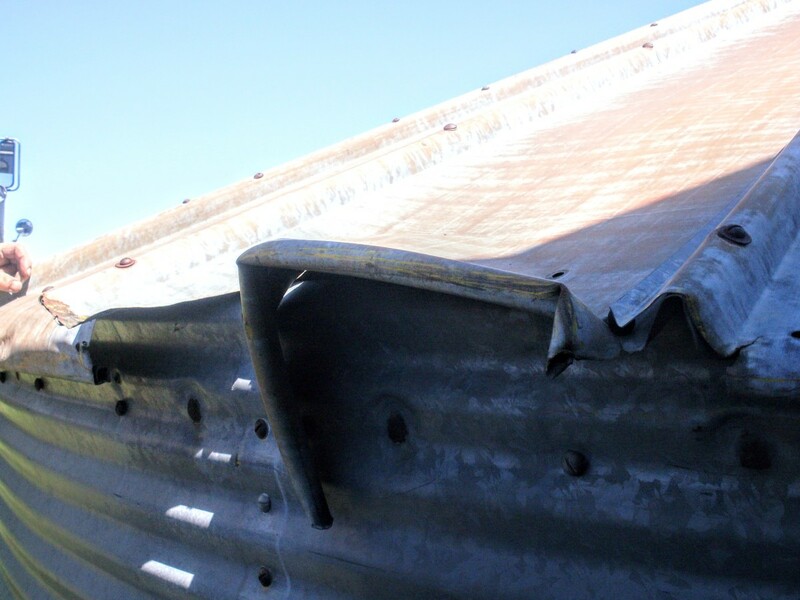 Carefully assess any damage to roof sheets, and determine whether you should fix the sheet(s), or replace them. 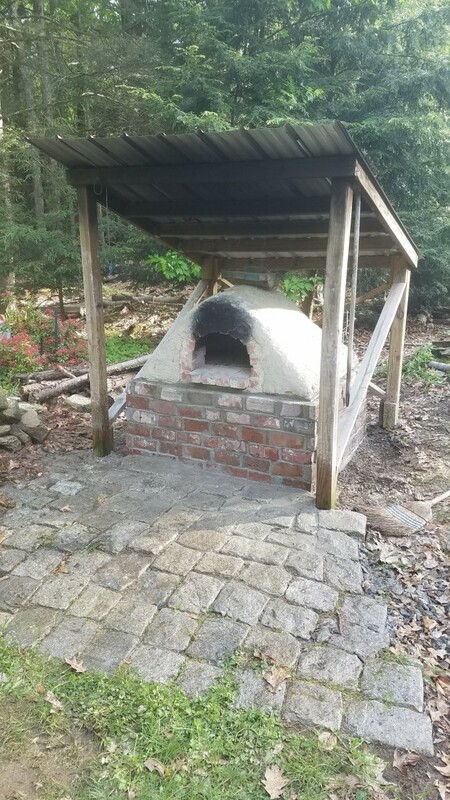 You will need one person inside with vice grips, and another outside with an impact wrench (this picture was taken about halfway through the roof disassembly process). Remove all bolts except top and bottom ones (collar and bottom lip). Start with door sheet. Tool needs vary. 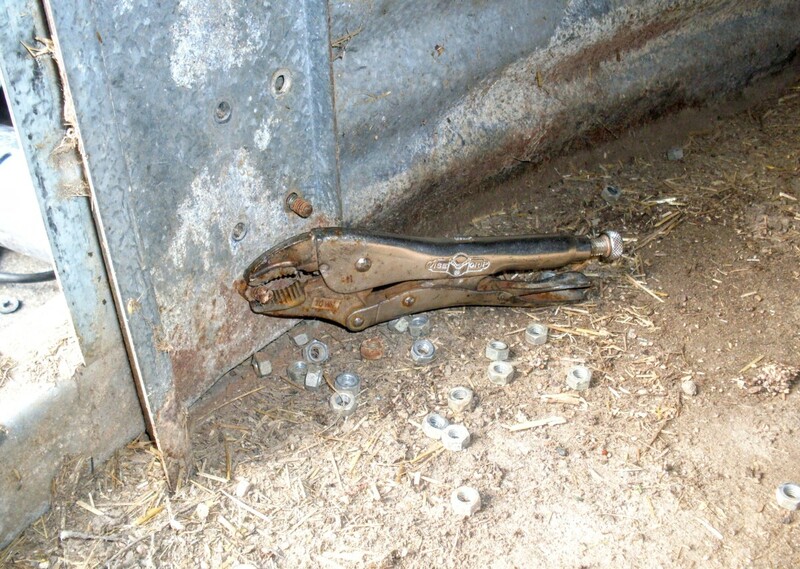 Some bolts will be stubborn (or possibly of an odd make), and require different tools. Next, you will remove the sheet which was lapped under that one, before moving to the opposite side of the bin. You can take two per space, generally. 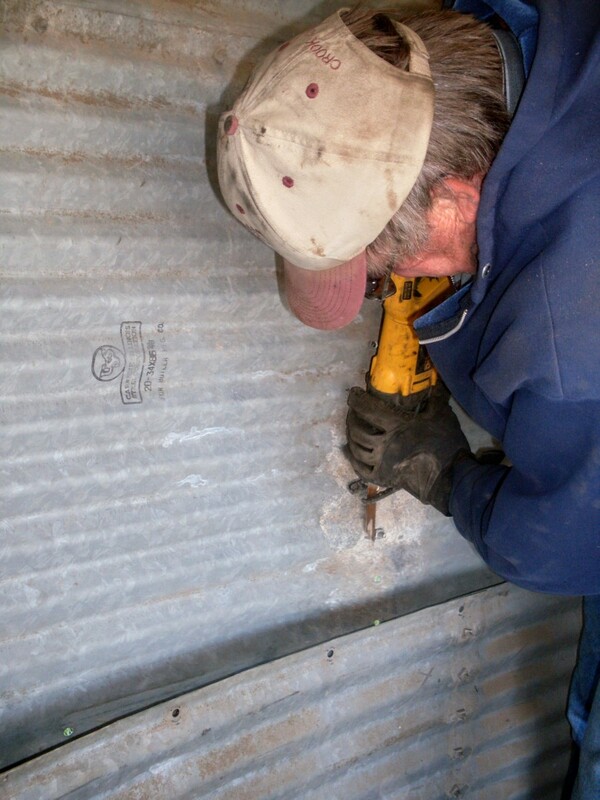 Remove top bolt only when ready to remove sheet, then slide sheet down and out, placing it on your roof sheet pile. While his co-worker continues to work on bolts, my husband begins removing the collar. My son Billy helps unscrew bolts. Some bolts are best ground off. Remove the lifting ring if it is in the way...which it eventually will be. 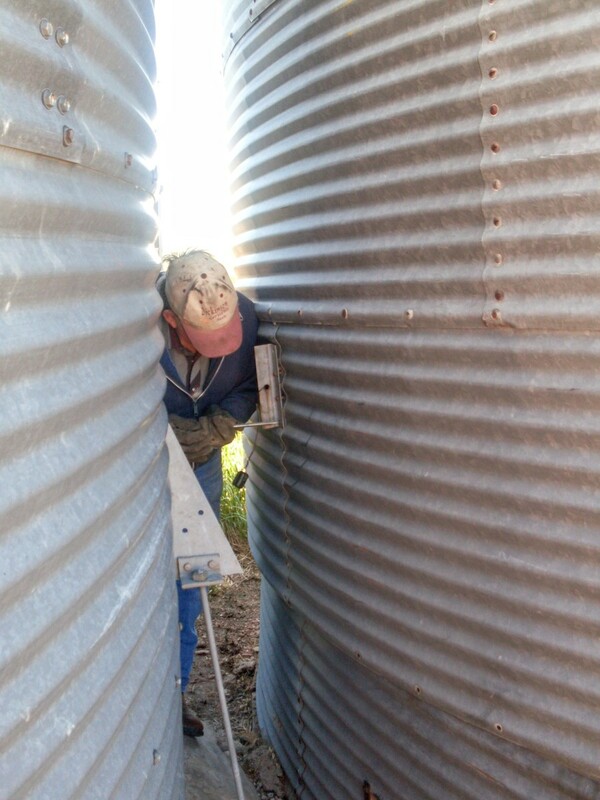 Some bolts are tricky to reach, from either inside or outside the bin. You may sometimes be able to take more than one sheet at a time. It depends on the size and weight of the sheets, and their general condition. 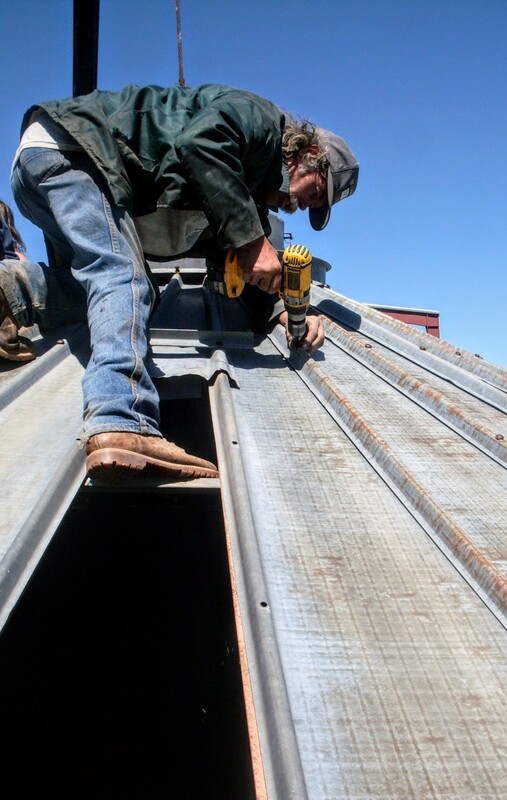 Once you are down to a few sheets, you will need to rest the centers of the roof sheets on the ladder. ...and carefully lower the last sheet with collar to the ground. It is fragile, and can be quite heavy! Rest second-to-last sheet on ladder, until there are two sets of hands free to support and unbolt it. Finish unbolting sheets, and you are done with the roof. First, loosen bolts down each seam with impact wrench. Bang sheets away from foundation, and each other, if necessary. Finish separating any sheets, after getting them away from foundation. We have been asked what kind of trailer we use most for grain bin moving, especially when we don't completely disassemble a bin. It is basically an iron framework...and it is too big to be legal in most areas, being 16' wide. Be aware that, on any interstate, you cannot legally move anything over 8'2" inches wide without over-wide permits. But - if you have completely disassembled your bin, as shown in this article, this shouldn't generally be a problem. We have hauled bins larger than the one shown in a pickup box trailer. However, be sure your trailer and towing vehicle can handle the weight and size of your bin. Check width restrictions on the highway(s) along which you will be moving. Check your State's agricultural equipment highway laws, too. It is perfectly legal in many states to pull practically anything down the road with a tractor, or with a truck that has "Farm" plates on it. If your State is this way, you won't need overwide permits, provided you can use farm equipment or a truck with farm plates. 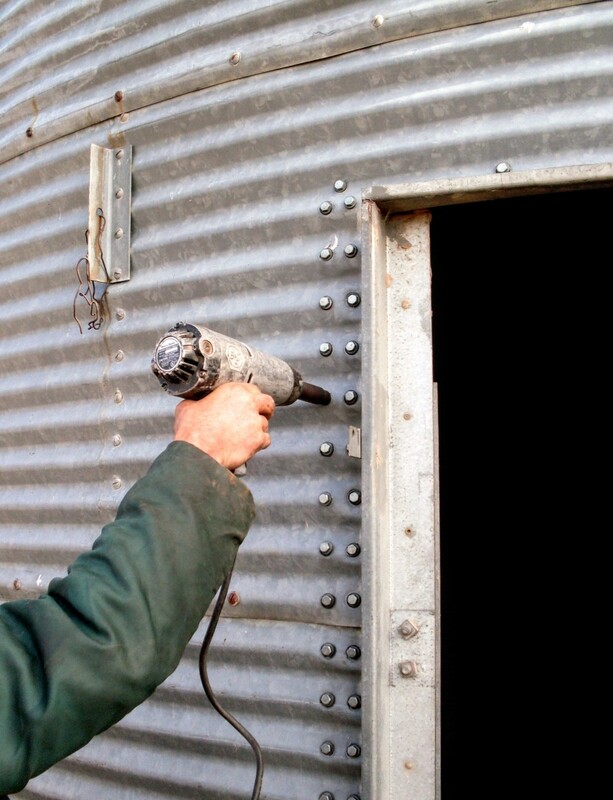 Tools and Supplies For Building Grain Bins - Punches, Bolts, Jacks, etc. 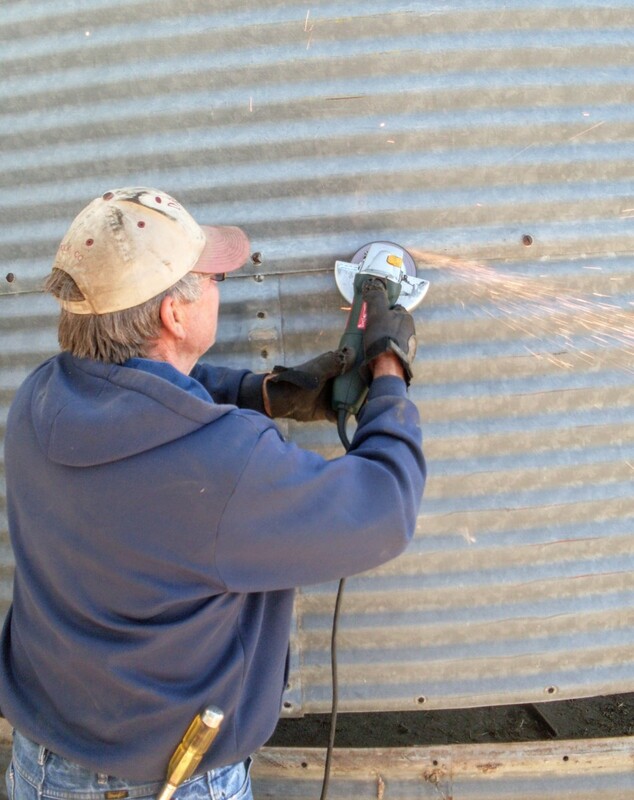 High quality hand tools for grain bin construction. Designed for daily abuse to last a lifetime. How much does each panel on the wall weigh? I have a 21x20 7 ring to tear down. There is no logical way to answer this question because sheet weight will vary depending on brand. Also, weight increases toward the bottom and sheets may weigh 40-70 lbs. on a smaller bin, depending on their placement. So, mark your sheets during tear down, so you can put them up in the same order. Otherwise, your bin may collapse, if you put lighter-weight sheets toward the bottom. JC, so glad to hear the article was valuable to you! I have received quotes for bin dismantling I really thought was a joke and your article was very helpful and informativ. Should work. Watch powerlines. Sorry for losing your comment...you've probably finished your project by now. Jason, this is exactly the sort of comment I like to hear! This is a bright spot in my day. What a great article! Thanks k you for posting. I came across some grain bins yesterday and have not stopped thinking about several uses for them. Your article has just solidified the fact that I can move them and will be going forward with my little creationsister. Thanks so much. Fin: As I have said in an earlier post you don't have to disassemble them from the bottom up. You can use scaffolding on the inside and good ladders on the outside and take em down from the top. Not sure if you want to go the trouble but it does work as we took down and reassembled an 18'D and a 21'D 6 ring each high this way. Works best to have about 3 people doing each panel and lower and raise them with 2 ropes attached to quick release clamps. Gets less scary the lower you get. Just be careful up top. Sorry Jack, we are not for hire now. Best of luck finding the help you need. Sorry Jack, no to both questions. We have two small 14 ft. Dia. Butler gain bins .maybe 10 ft high. Can we move these without tearing them down . Bolt supporting timbers on bottom ,tip them onto car hauler to move a few miles down the road ? Anyone ? 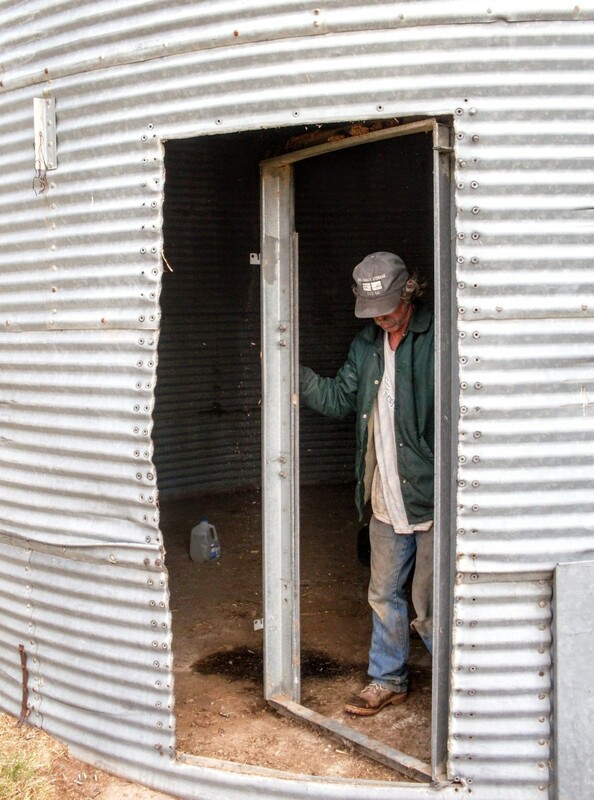 No, we no longer travel to build or dismantle grain bins. Sorry. Thanks for the offer, but we are not interested in traveling to dismantle bins. The price will be influenced by what size of bin you have, and possibly site restrictions. 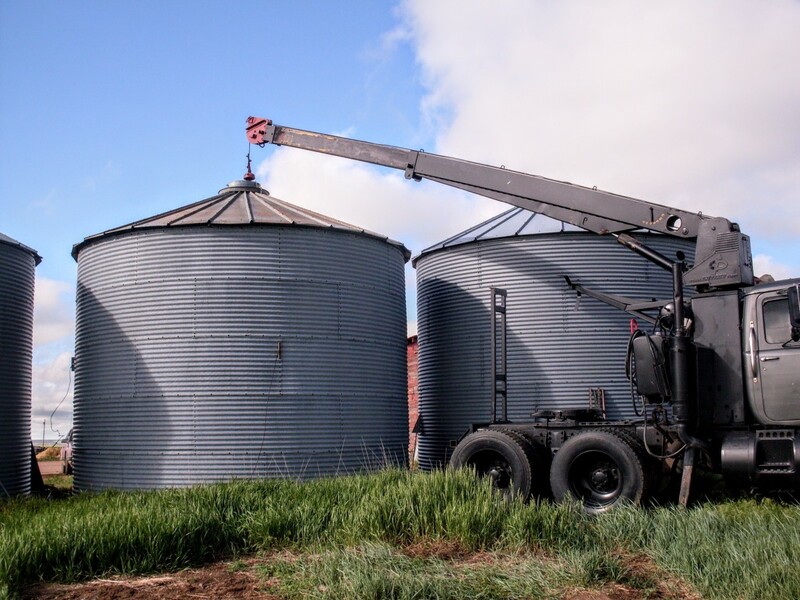 For example, what is the diameter and height in rings of this bin, and is it a clear site, with crane/boomtruck accessibility? 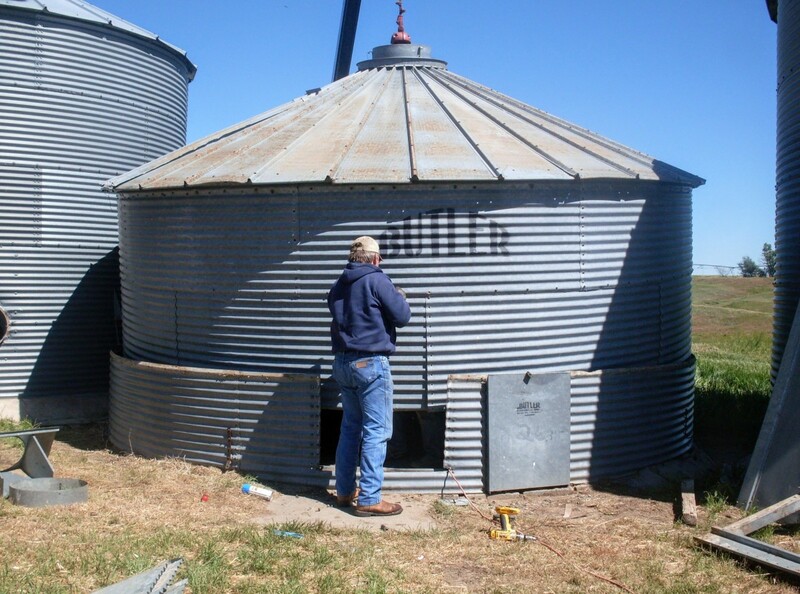 I do not know of anyone in your area who builds or deals with grain bins, but if you look through the comments section here, you are likely to find a phone number for such. 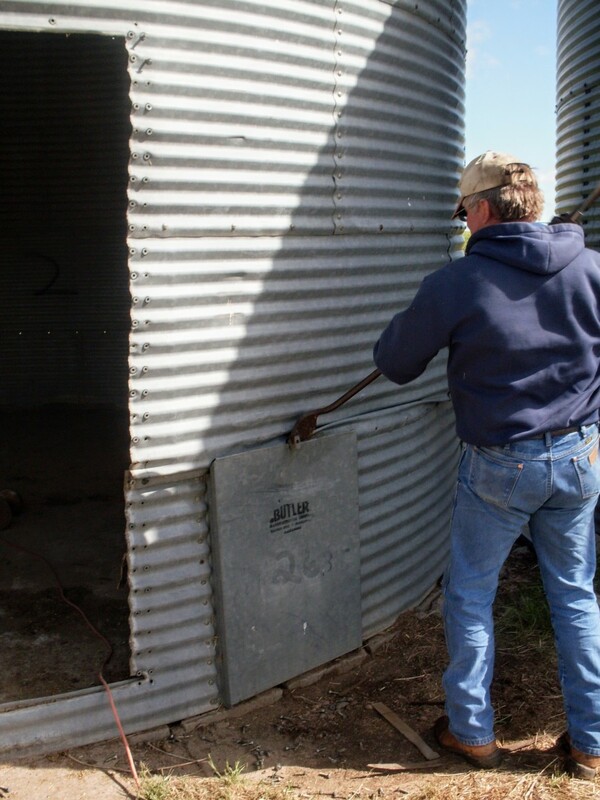 Also check the Comments section on my How to Move a Grain Bin article. Are you still doing this? We have one in Idalia CO that needs dismantled. 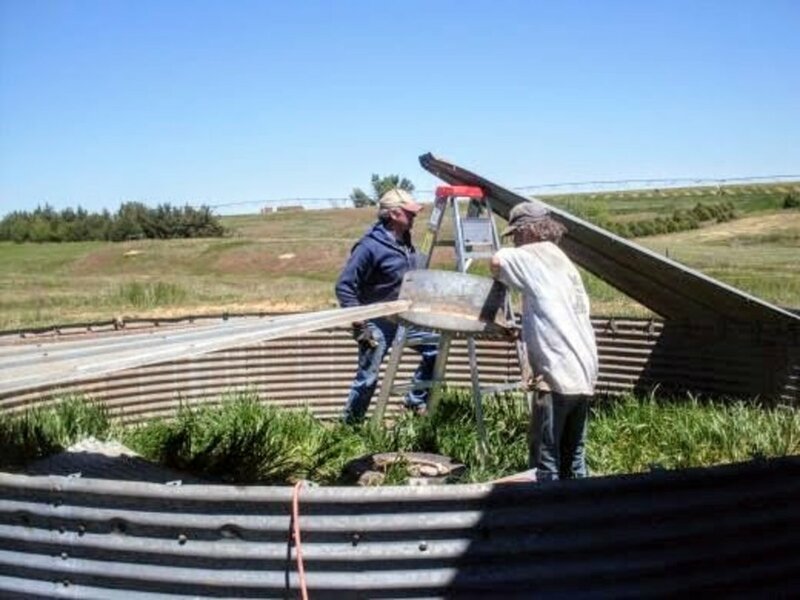 I am looking for someone to dismantle a bin in Idalia CO. What kind of price am I looking at and then would you be interested or know of someone? 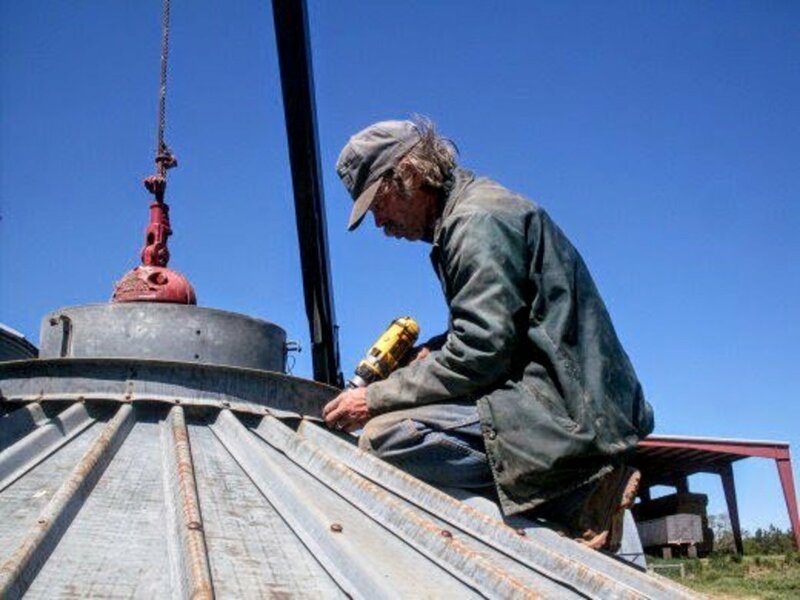 If you buy the bin for $.20 a bushel, pay $.30 a bushel for a complete tear down, transport on a trailer, then pay $.30 a bushel for re-erection...this would probably be justifiable...if it's not a rust bucket. That means you're paying $.80 a bushel for the procedure. It is a lot of $, but not as much as a new bin. Hubby does not want the job. 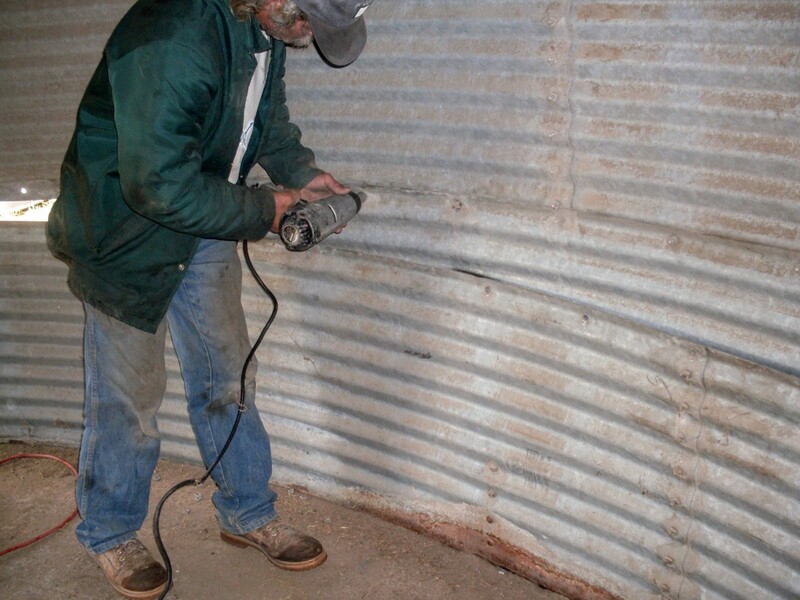 Contact RPM (under Grain Bin Construction in your Yellow pp.). They are in the Grand Island area, are competitively priced, and have all the equipment. 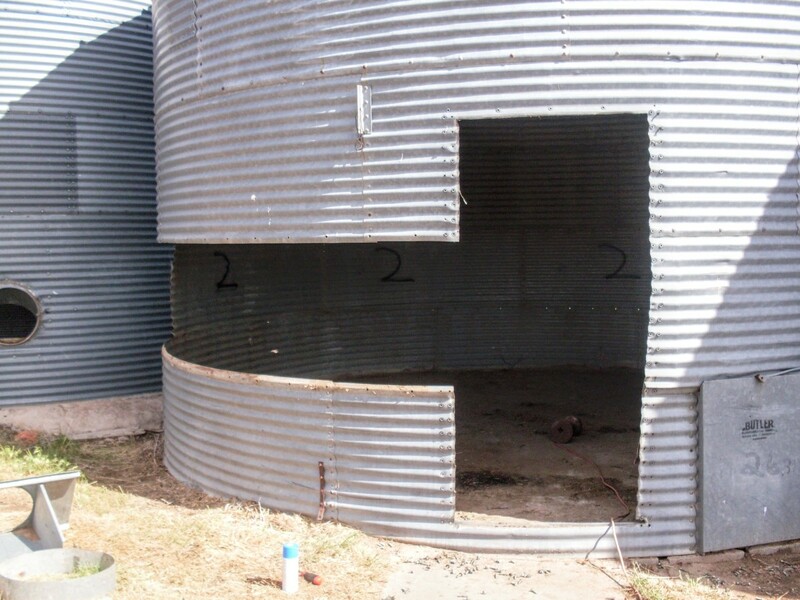 There are a number of grain bin companies in the G.I. area, for new construction, as well. Many of these are listed in my Finding Bins article. Ken Koester (sp.) also does great work. He's near Elsie or Madrid. We have worked personally with him. I had his phone # ready for you, but part of my message was deleted initially, so I will have to look it back up, if you are interested. I don't have it at hand, as it's in my husband's cell phone. Last I knew, Ken's # wasn't in the regular book, but that may have changed. Zach, I apologize for the tardy reply. I don't often have an opportunity to access and reply to comments. I will discuss this with my husband and get back to you ASAP. Is there a particular time-frame for this work you were thinking of? Hi. 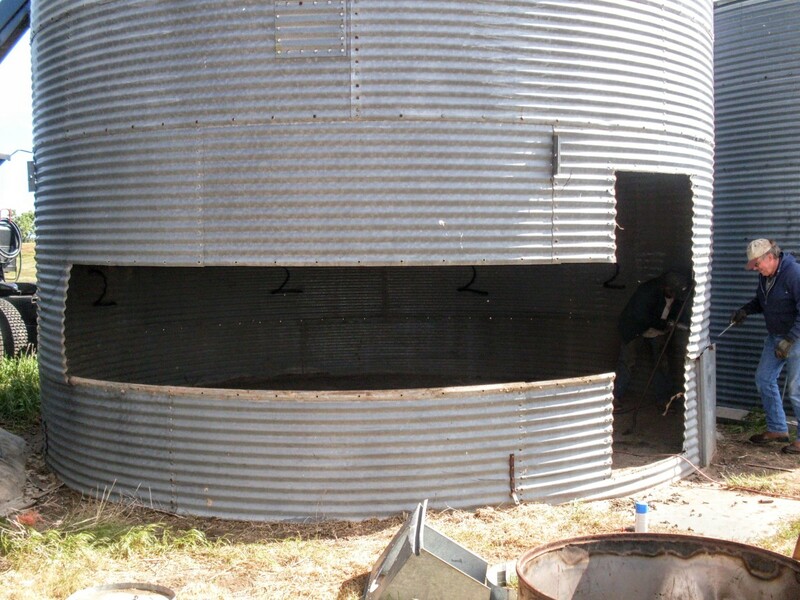 I have 2 3,000 bushel grain bins for sale. Both are in great condition & still strong enough to hold grain...but we just don't use them anymore so it's time for someone else to enjoy them. I have electricity availble, if needed. I've got an organic apple & pear tree if you need a treat while taking these down. I'm 40 miles SE of Des Moines, Ia. 641.780.3660 if you're interested. I have 2 3,000 bushel bins. I have electricity on site along with organic apples & pears...if you need a snack when tearing down. I'm SE of Des Moines IA about 40 minutes. 641.780.3660 Thanks! 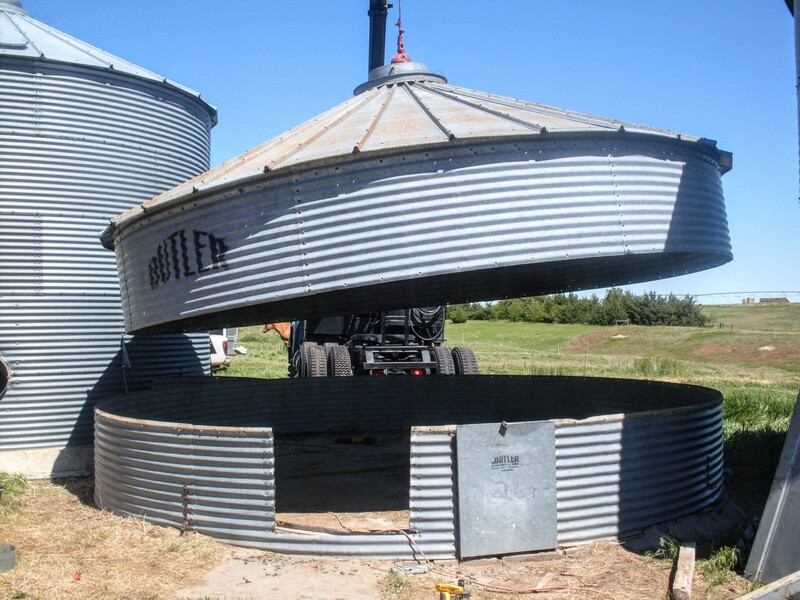 I have a small 2,000 bushel butler grain bin for sale sold 6 of these past two years last one left! Some have been turned into sheds by the buyers or even a gazebo!!! Big walk in door buyer take apart been getting $500 a bin call 507-995-9296 Lamberton Minnesota power on site for your impact wrenches!! Thank you Jimji, that was very informative. Looking forward to the pictures! Hard to say how long it took to raise one bin cause it was done in 3 different segments. Getting several people together is the key to safely putting up the higher sheets. We had 3 on the outside on ladders and 3 on the inside on scaffolding. Also another really helpful piece was taking the time to pour a 12" wide foundation ring. 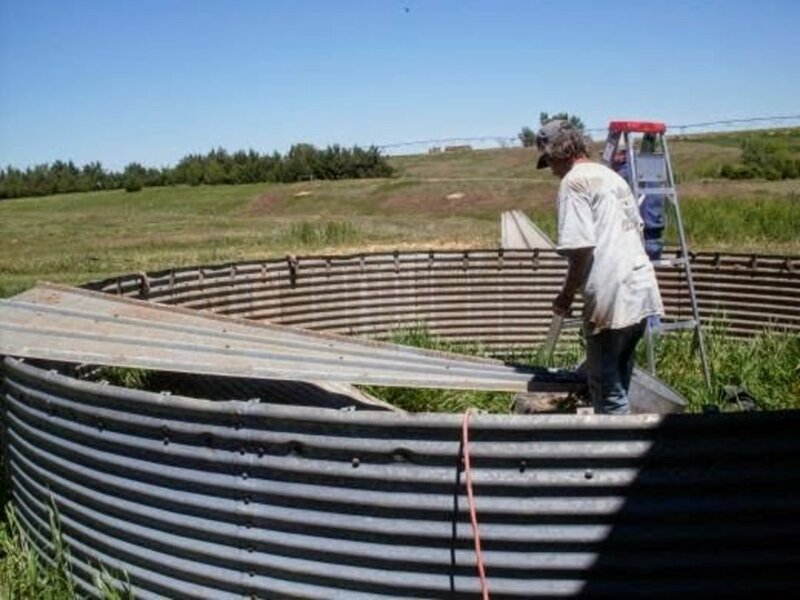 We have 2 bins that will be connected to each other by a 20' long solarium so it took a bit to get the foundation forms all level but is so worth it to have a nice flat surface to start on. I drilled holes in it afterward and put 8 - 5/8" bolts down around the inside with a hand made steel plate 3"w x 4" long to hold down the lip of the bin. One for each sheet. Haven't gotten the roof pieces up yet but will let the young guys handle that though I want to make a 2 x 4 brace that sits on top of the scaffold to hold the center ring in place before connecting the roof pieces. 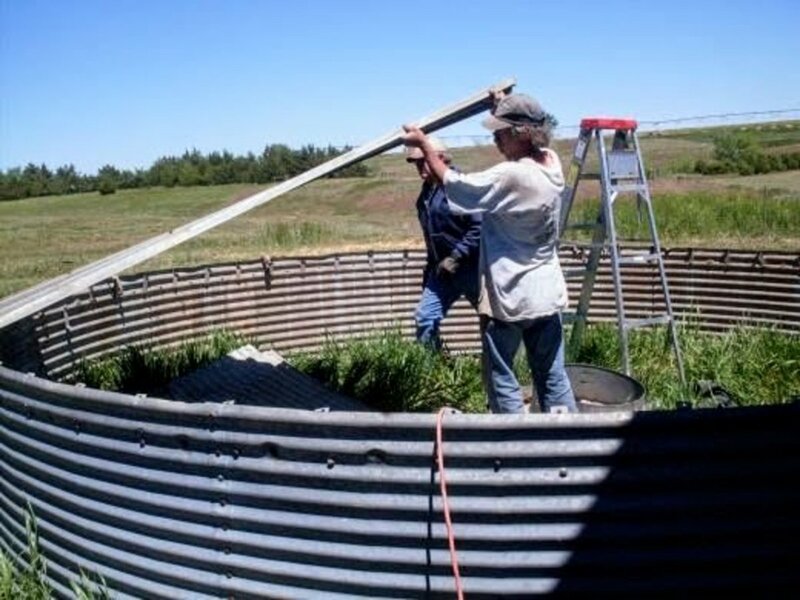 Also plan on laying some heavy plastic around the outside of the bin before covering with sand as there is just no overhang on the roof to direct water away from the foundation. I will try to post some pictures soon. I am curious, how long did your method take you, to build and finish the bin? Thanks, in advance, for taking the time! You may find some helpful tips there, both in the body of the article and in the comments. Do you have specifics on the bin(s) you want to move? There are several factors to be considered. It would help to know the diameter, height, and brand you are looking at. How big A bin can you lift just by hooking on to the roof ? A cheap source, no. 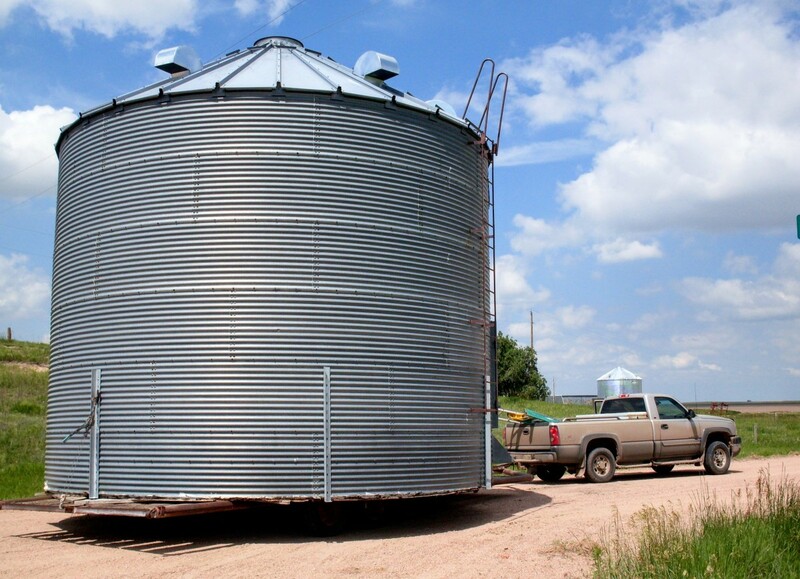 Look in the Yellow Pages under Grain Bins, and Grain Storage Systems, to find out what is currently available to you. Yes, they generally come with appropriate washers. Thanks for the comment on the weight. That helps. Does anyone know a cheap source for the nuts and bolts needed for reassembly ? Are there rubber washers on each one or what ? This is joy's husband. Don't know exact wt. but it isn't much at all. 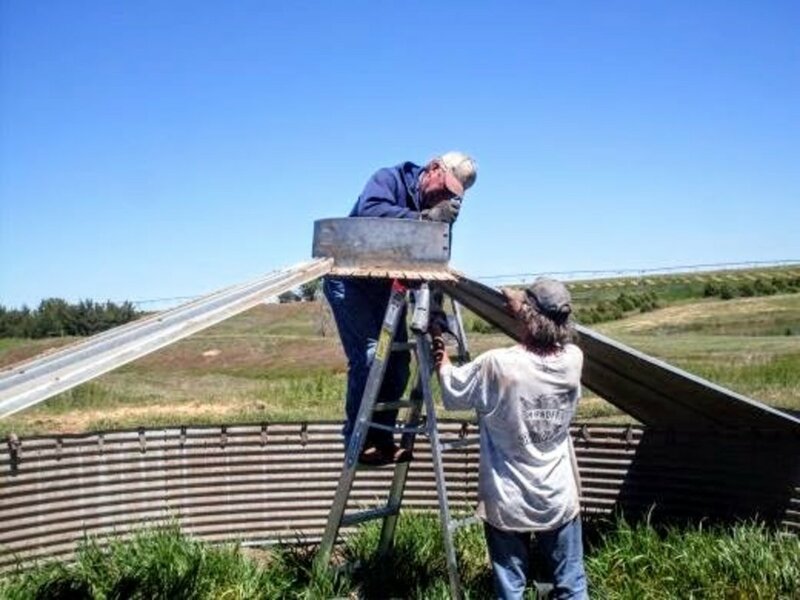 I doubt if each roof sheet weighs 25 lbs and the rest of the bin will also be light. An Obama built S-10 will pull it. I'll pass on the request to my husband, as he would supply the bid or estimate. 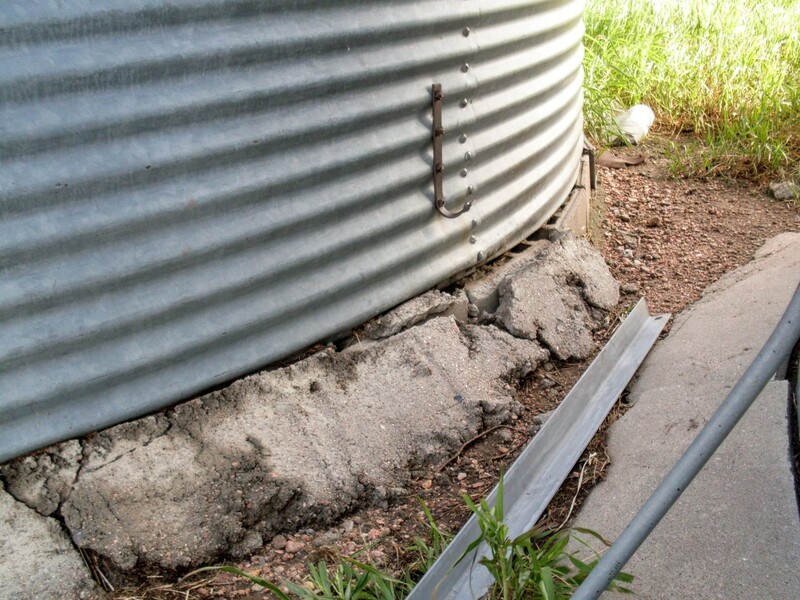 I am also in NE Colorado, just wondering if I could get an estimate on disassembly of an 18 foot bin. 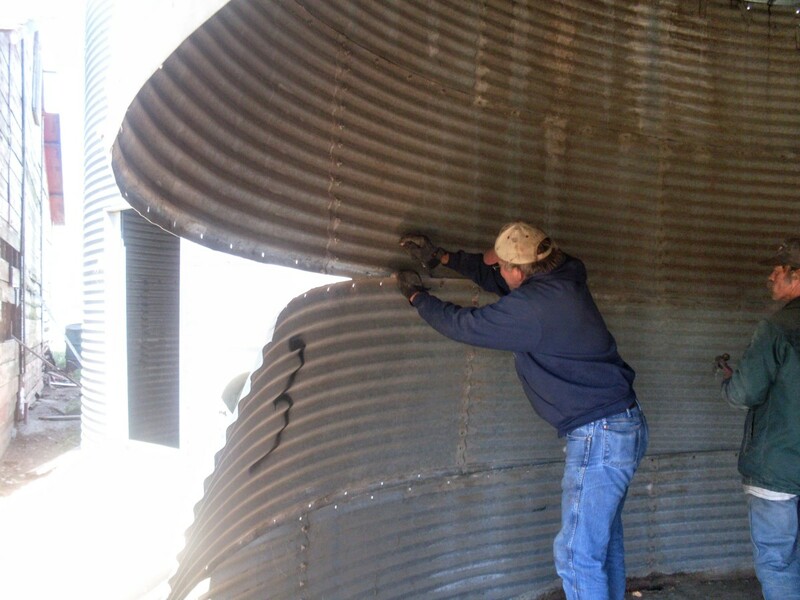 I have never tried flattening a grain bin or silo panel. I do know they are very difficult to bend back into their correct bowed shape once they get damaged by wind, hail, etc. It is usually more productive to get a new panel to replace the bent/damaged one. If I happen to come up with any ideas for flattening a panel *evenly*, I'll try to let you know...but I would probably opt to steer clear of the whole idea, and just use panels that are flat to start with. 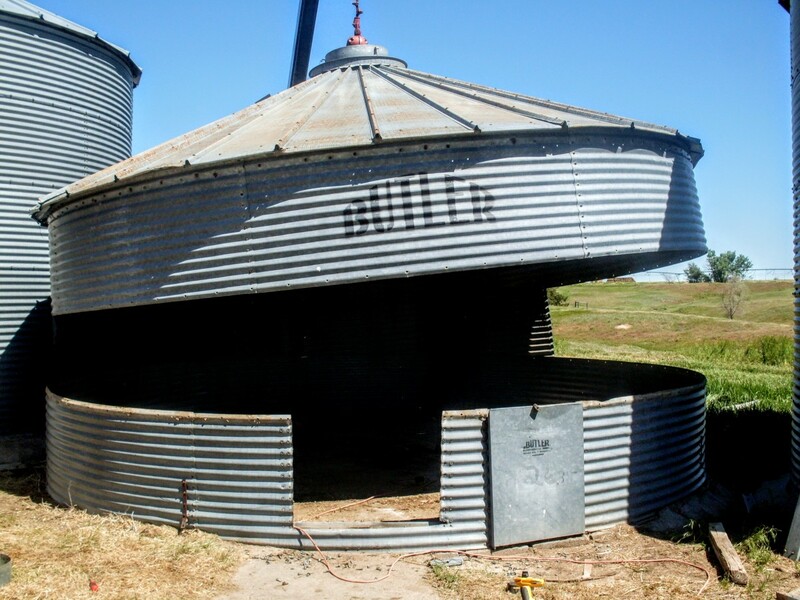 Have two Butler Grain Bins for sale here 18 feet diameter 16 feet tall 3,300 bushels have another 18 foot not as tall called a long brand grain bin. 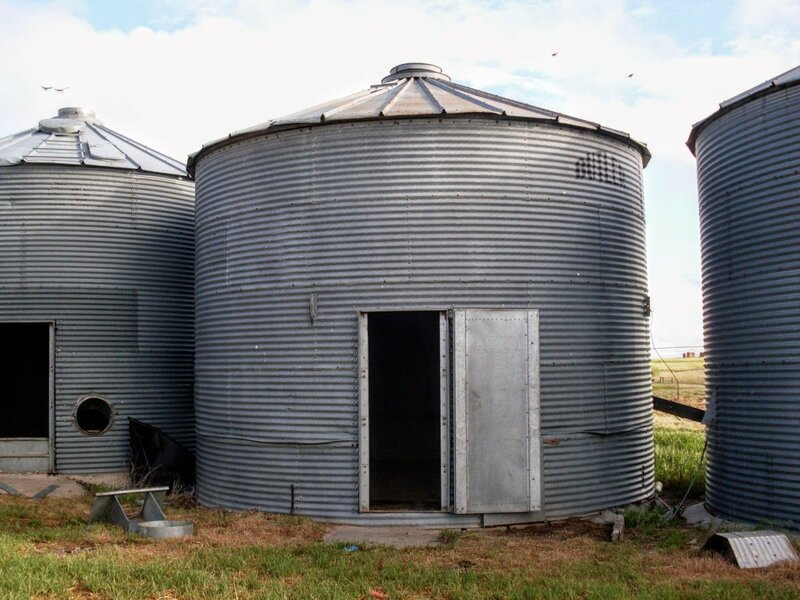 I been selling my bins for $500 each of this style, Minnesota here Southwest part Iowa South Dakota Border can email or text pictures of the grain bins 507-995-9296 reason for selling is retired. We can't get out hands on a crane or a boom truck.. How about a Forklift which can lift 8000 pds. 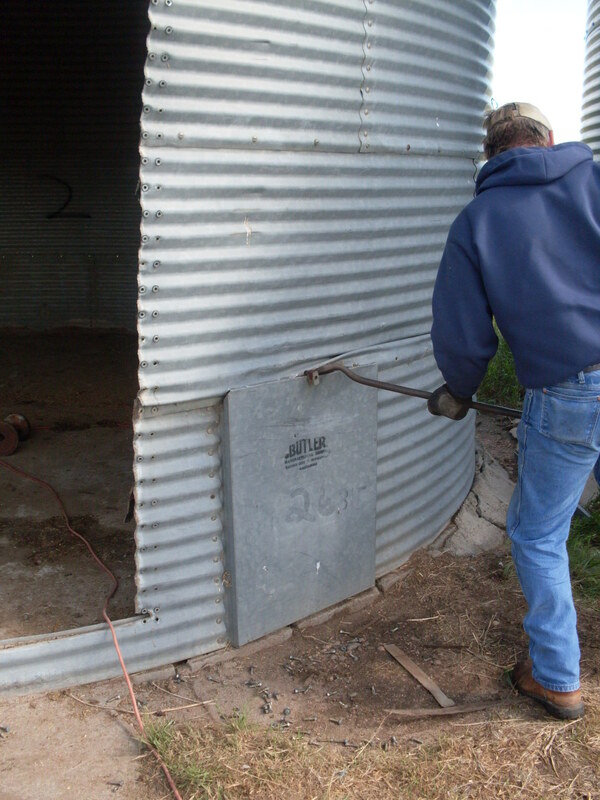 We have a 20', 4 ring grain bin. What is the approx. weight of each pannel? We are based in N.E. Colorado...a bit far, I think, to be of use. Hello I was just wondering where you are based from. We have a bin site on our farm that is no longer in use. We have been trying to figure out how to have them removed. They are located in a town called Alta, Iowa. Do you know of anyone in that area that we could contact to find out if they are interested? Thank You. 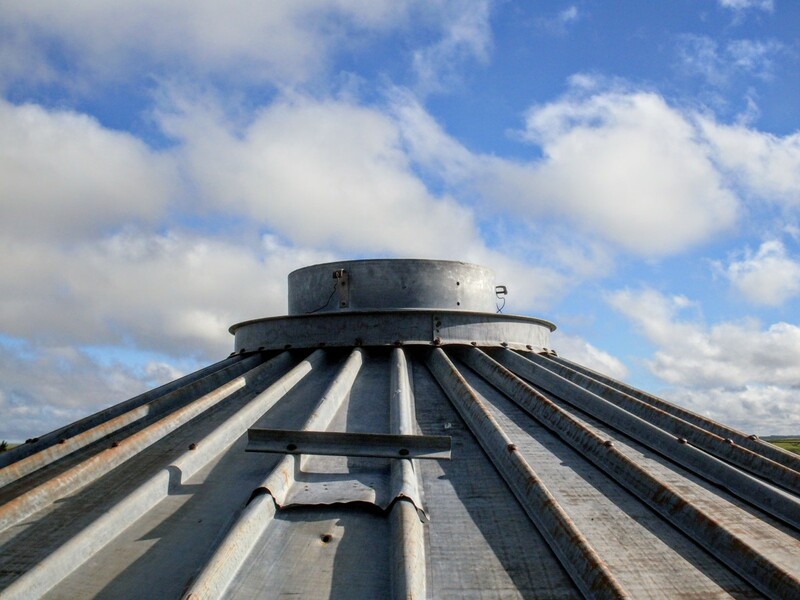 Due to the fragility of the roof panels when separated from each other, there is no safe or logical way to dismantle the roof first, that high up in the air, and work down from top ring to bottom ring. The strength of the roof is rather great when it is whole, but it can be delicate when taken to bits...especially half-way through the dismantling process. (Just like with a stone arch...it's hard to break when all together, but if you start taking stones out, you wind up with a mess in a hurry.) 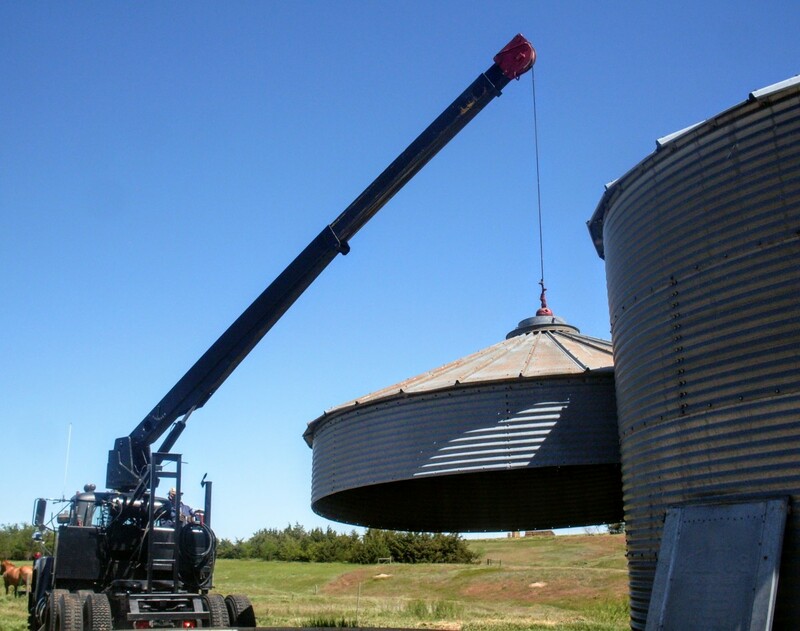 Either a crane or boom truck, or grain bin jacks, need to be available for safe dismantling of a grain bin. I hope this helps, and you're welcome for the info in the articles. How come you start with the bottom and work up instead of the top and work down? So the bin comes crashing down to the ground with each ring taken off? I've got your other grain bin article saved for reading tomorrow. I'm looking for a large one to fix up and live in so I'm learning all I can. Thanks for all the information! It's not necessary to separate each piece; 2 sheets at a time are fine if you can handle them. We left the bottom ring until last because it was stuck in the cement, with no reason to salvage it. We wound up taking it out and using the upper half of the sheets...the rest was pretty trashed. im looking at buying a bin for my farn the one i found is only 4 rings high and 51 feet round. would it be esential to separate every piece? i was hopping to possibly leave 2 sheets atatched to each so i can save as much of the hardware as i can also why did you leave the bottom ring until the last ? 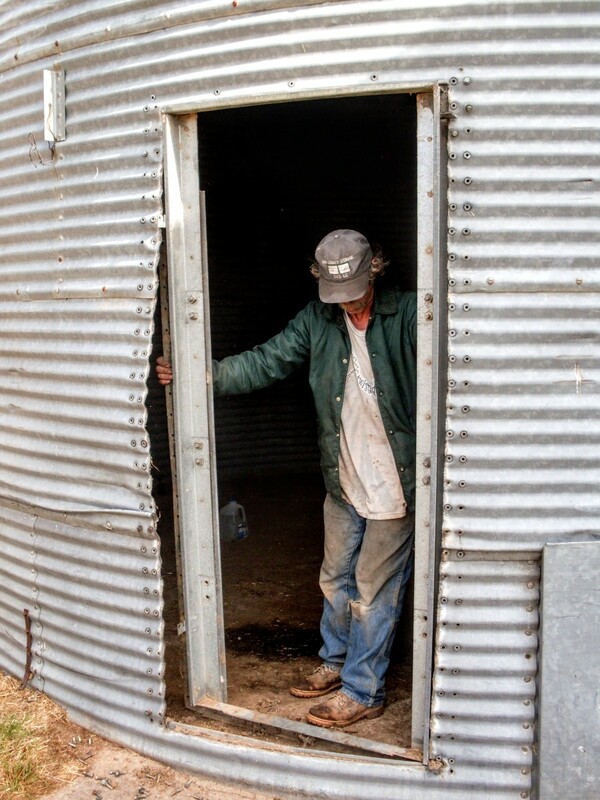 But frankly, up until the time I had to start working in grain bins, and do or die, Dad's big bin with the pit always scared me. I must confess, grain bins hold a certain fascination for me. 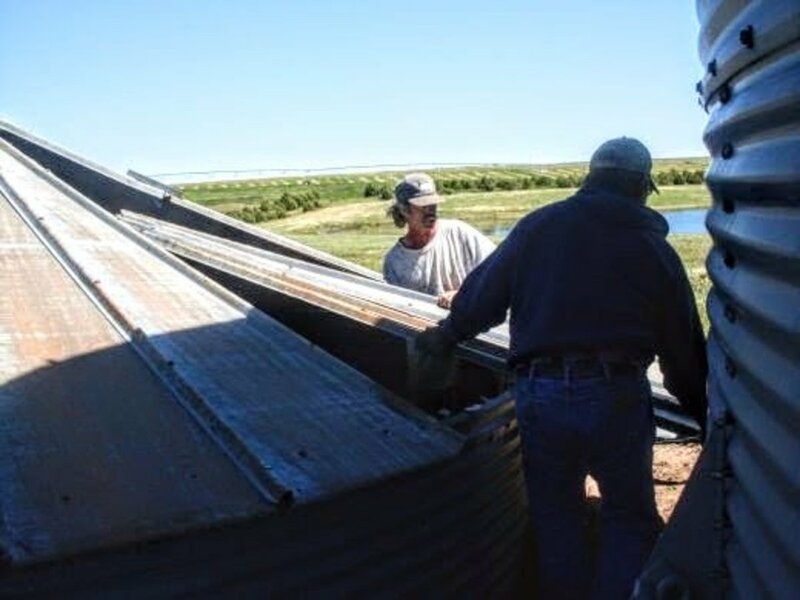 I remember how I loved to try to walk around Dad's bins on the bit of foundation (it was pretty narrow), and I always thought it was so neat to be there when Dad opened the doors to get the bins ready for harvest. However, I must agree with No Body -- I would run screaming from a trailer full of bin parts that needed to be assembled, and the thought of the disassembly leaves me just as cold. 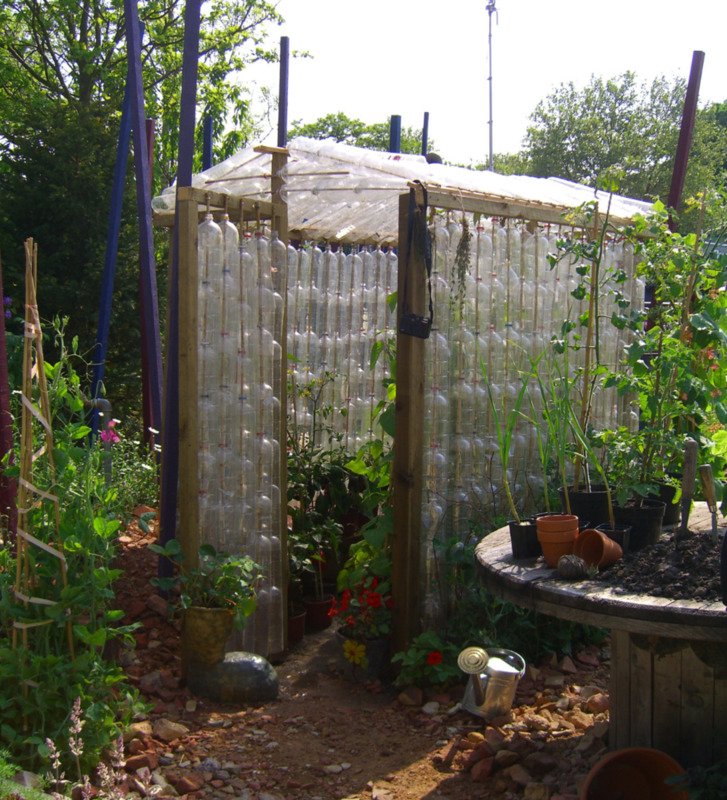 An interesting hub, though; I admire those who can and will work with such a process. LOL! I loved Lincoln logs and tinker toys! My dad made my siblings and I a huge set of square Lincoln logs, with which we could build towers and forts as tall as a kindergartner. However, I don't love grain bins quite so much. I just build them. They're hot, dirty, heavy, and exhausting...and you can't do anything creative with them - they only go together one way. Did you guys start out with Lincoln logs and tinker toys? because I failed at those as a kid. 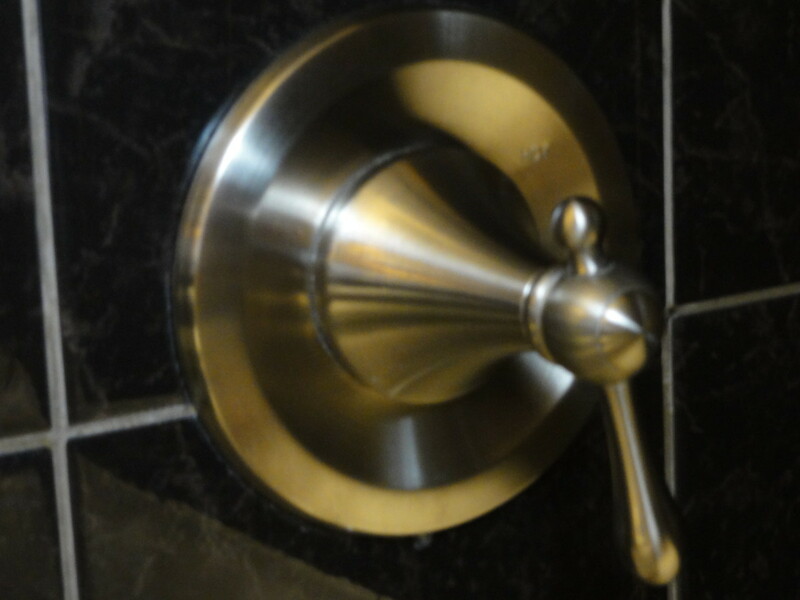 Can you imagine what I would do if I saw a trailer full of these big metal thingees. I would be under my bed quoting the Greek alphabet - backwards and blubbering! I know this is probably very basic stuff but I seems an engineering miracle. God bless you in your work and life. Much love Bob.